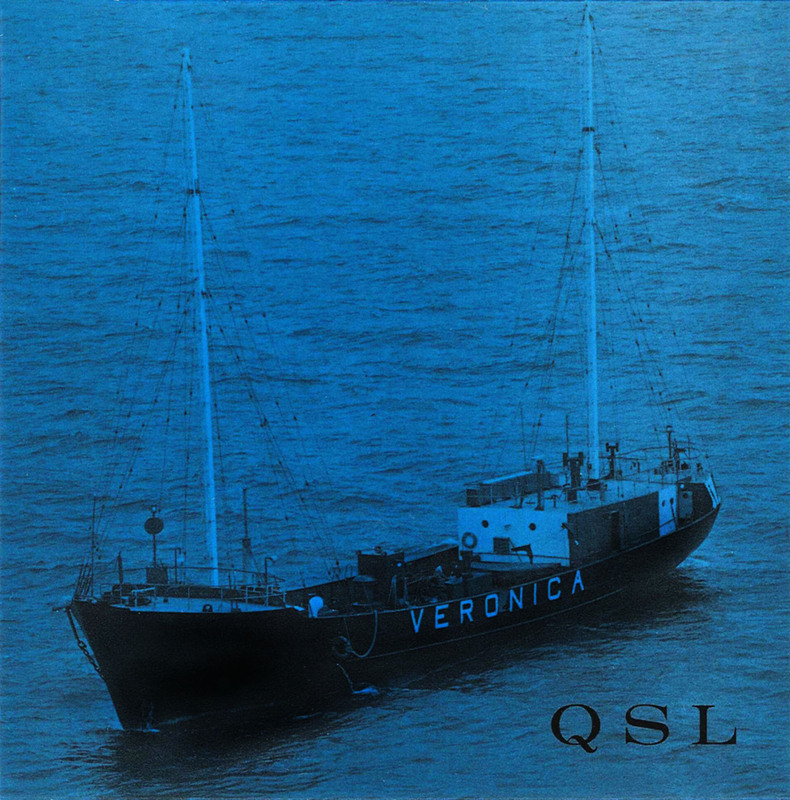 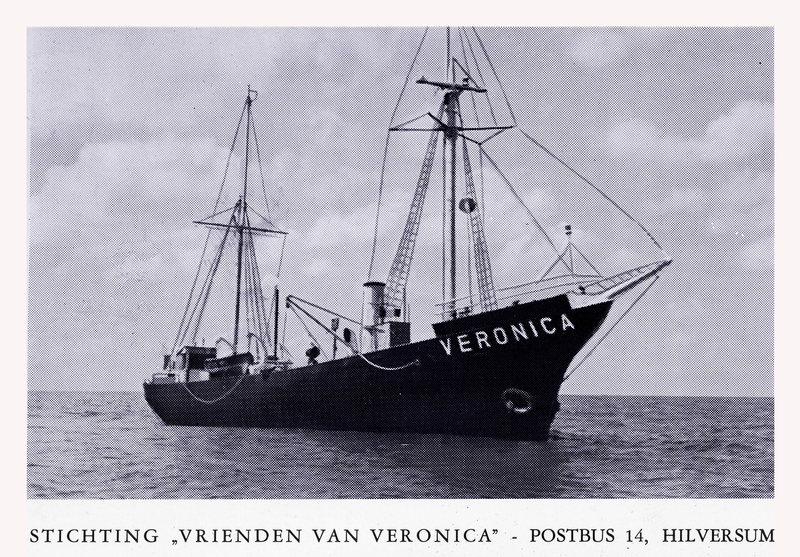 This is a brief history of Veronica at sea, from 1960 tot 1974, compiled by Jelle Boonstra. 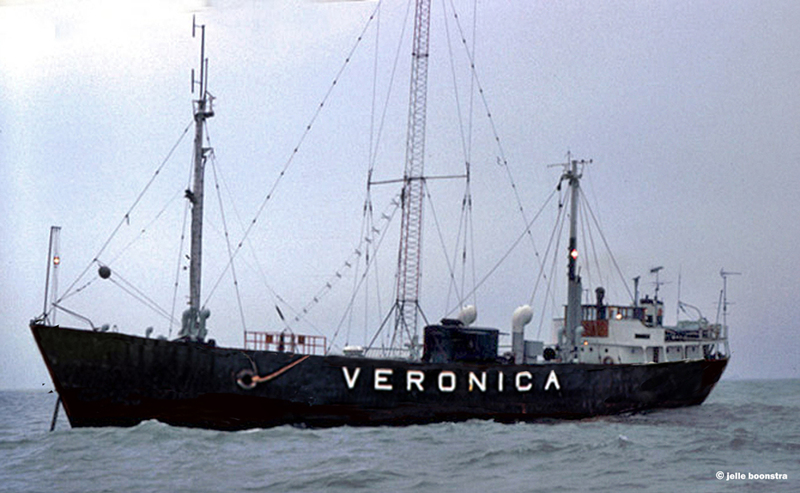 Radio Veronica was one of the most influential radio stations in the Netherlands, inspired by Radio Mercur in Denmark. 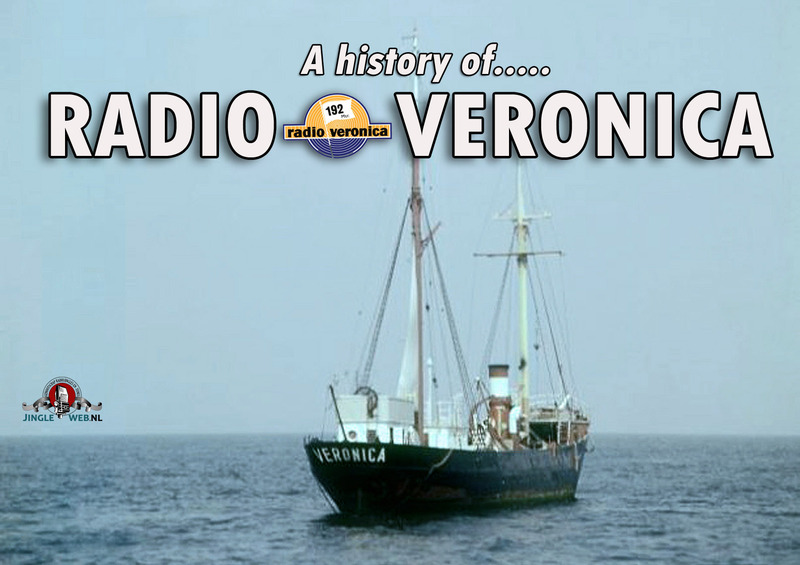 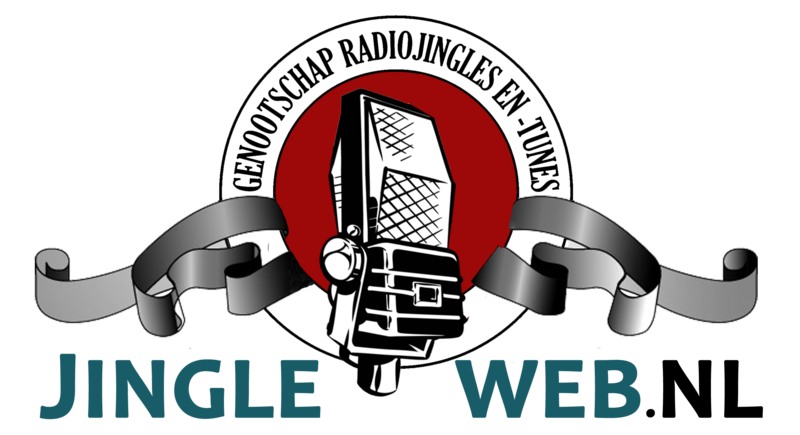 They started broadcasting in april 1960 from a nostalgic looking ship. 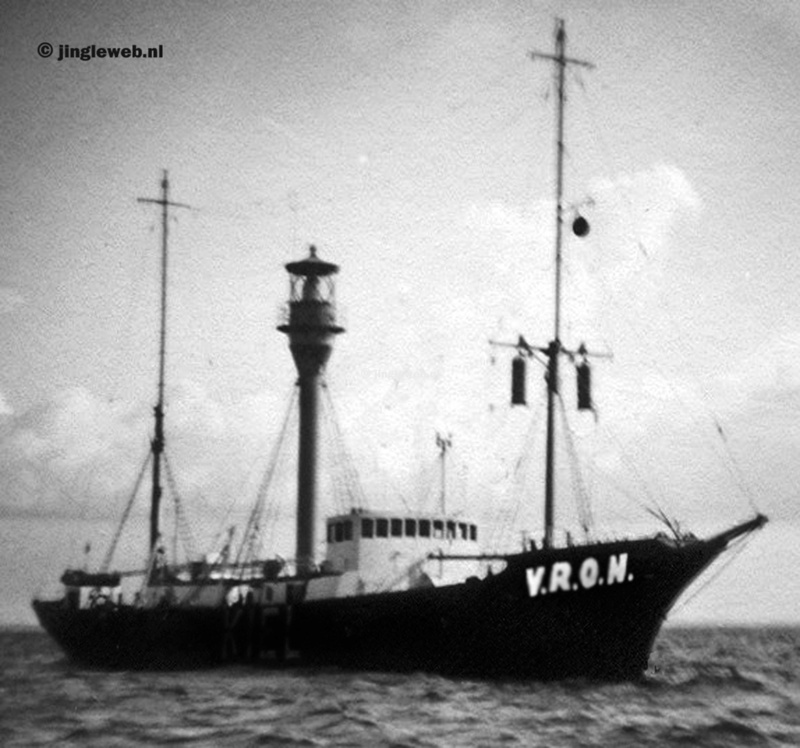 It was an old lightship, the Borkumriff, near the island of Borkum, that was retired (on this photo under tow to Emden in 1957.. 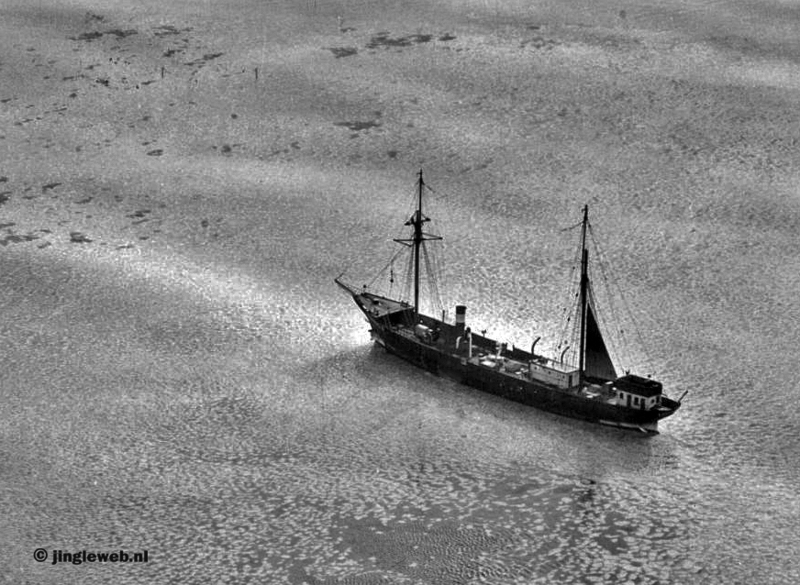 The ship was built in 1911 and served for 46 years in the ‘Deutsche Bucht’, here on a photo from 1934 (notice the nazi flag in top). 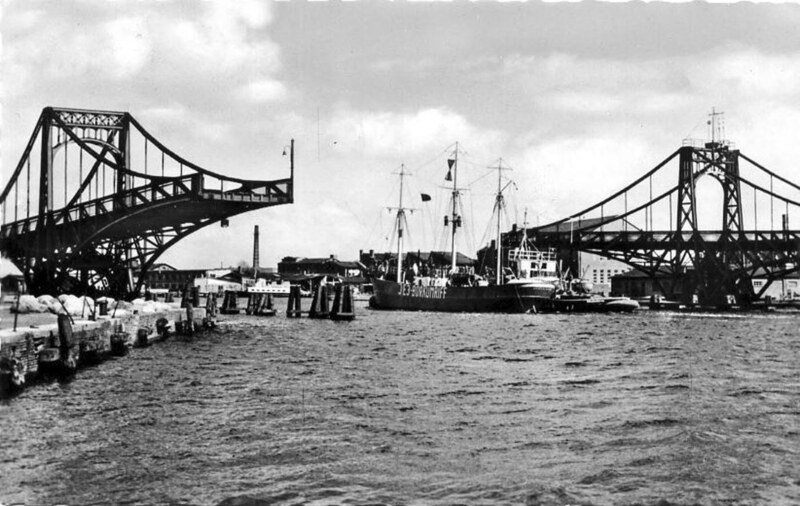 And here’s another one – from 1939, just before the ship was temporarely towed in when the war broke out. 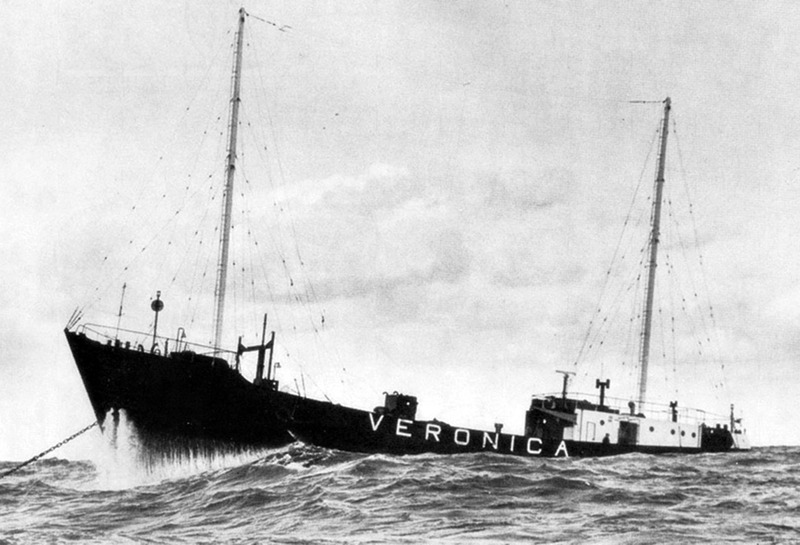 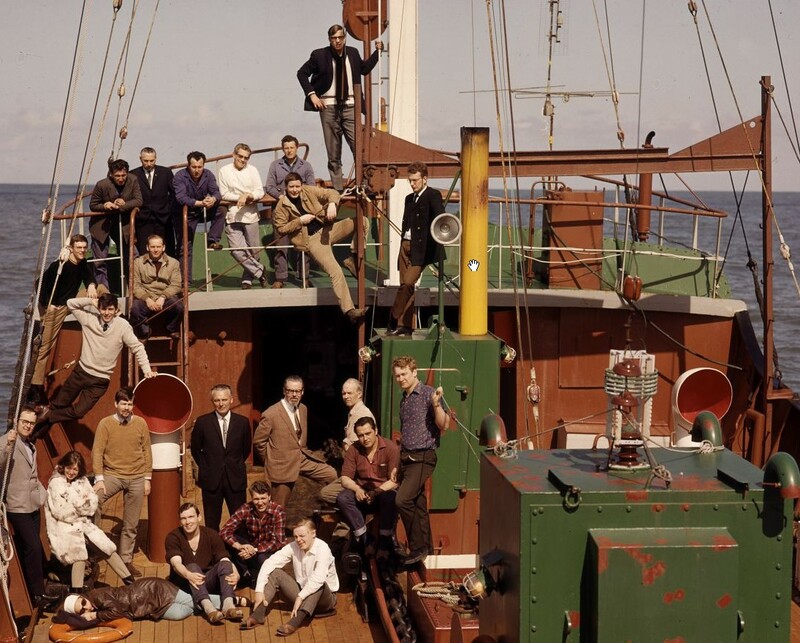 This is how the ship looked in 1959 when the group op Dutch radio pioneers bought it. 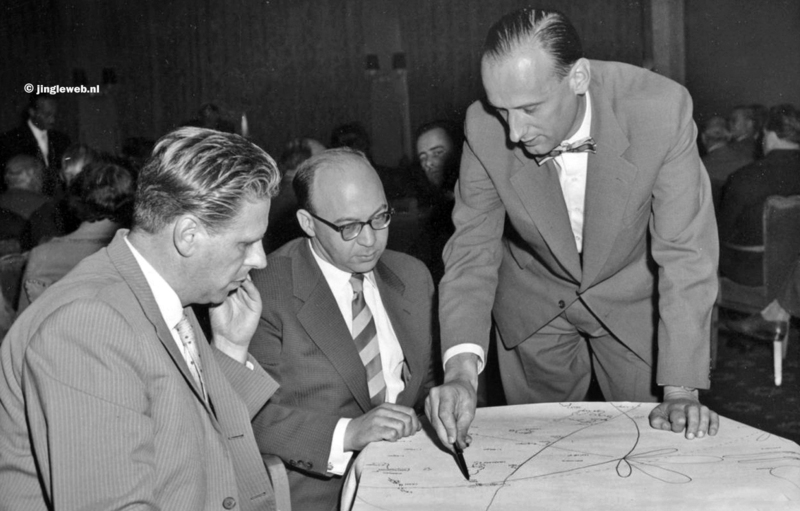 These are the pioneers Hordijk, Lewin & Oswald seen while discussing the reception area of the new station. 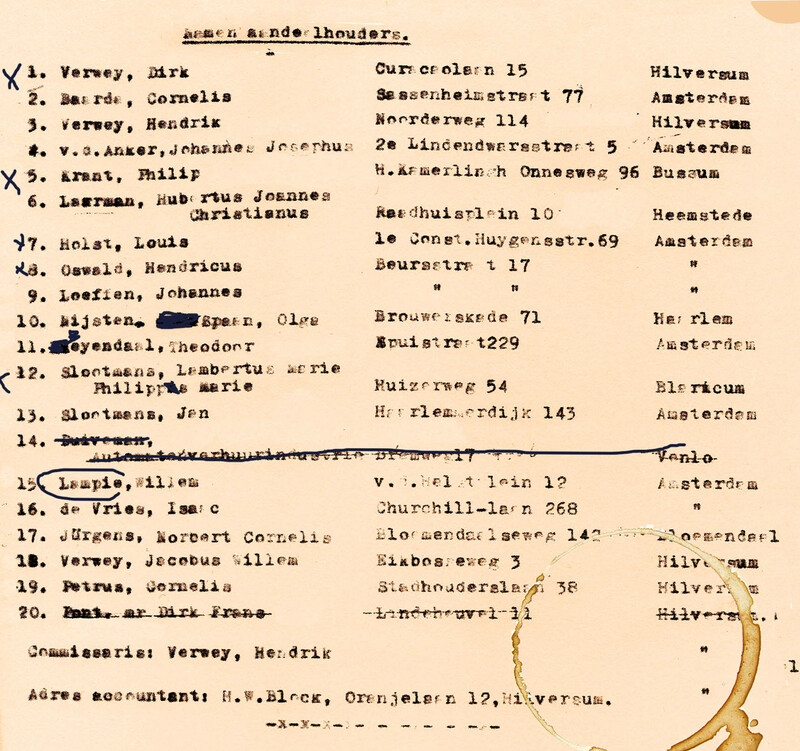 A unique document with the names of all shareholders, like De Vries & Lampie (wellknown advertisers for their wedding dress business later on). 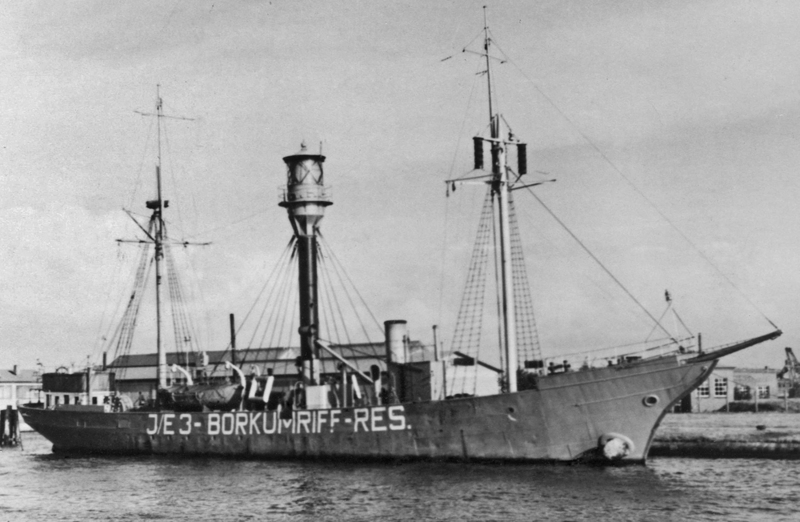 This was one of two photos they handed out to the press to show how the ship would look (actually, it was a photo of the Kiel lightship with the word Kiel crossed out). 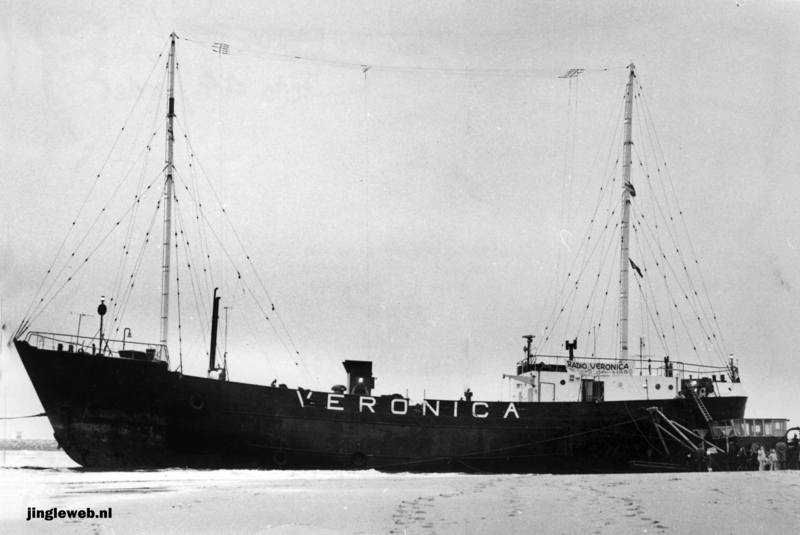 In reality It took them a lot of effort than expected to change it into a radioship. 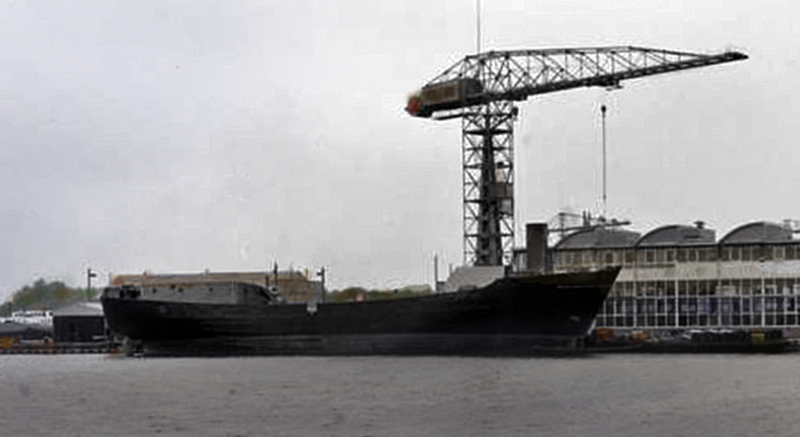 Here’s another one of the ship in dock. 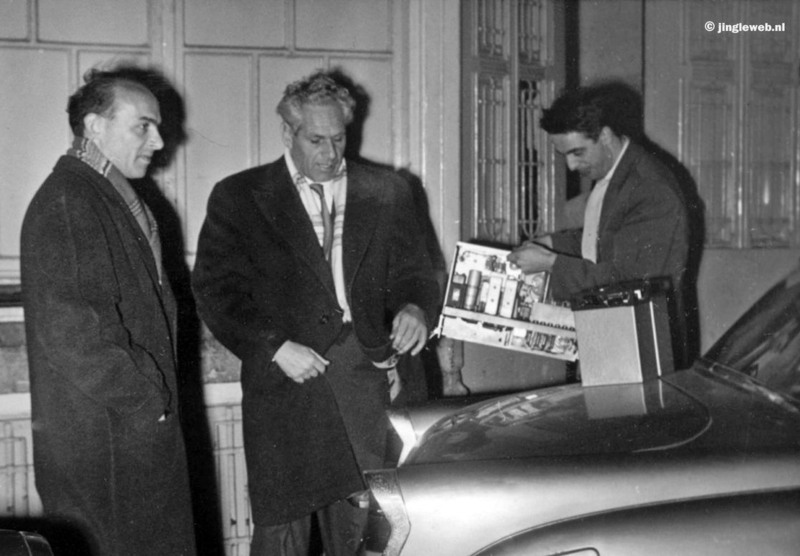 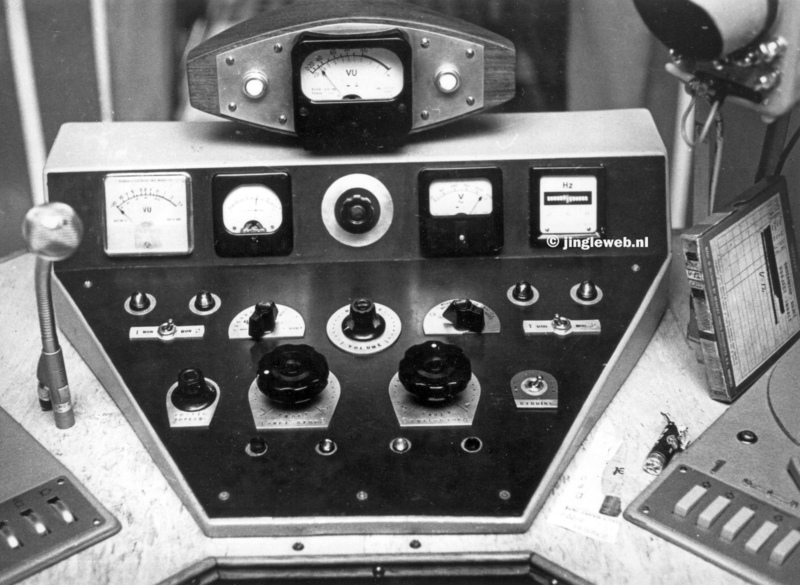 And the RCD (the agency against pirate radio stations) confiscated equipment, like here in Oswalds Amsterdam Beursstraat office (at the left is the notorious D. Neuteboom). 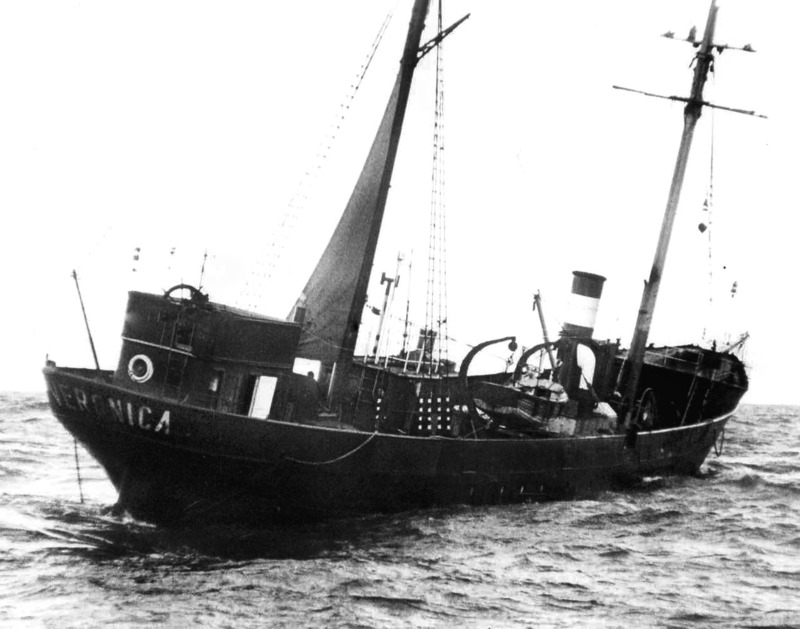 But gradually it turned to ‘Veronica’. 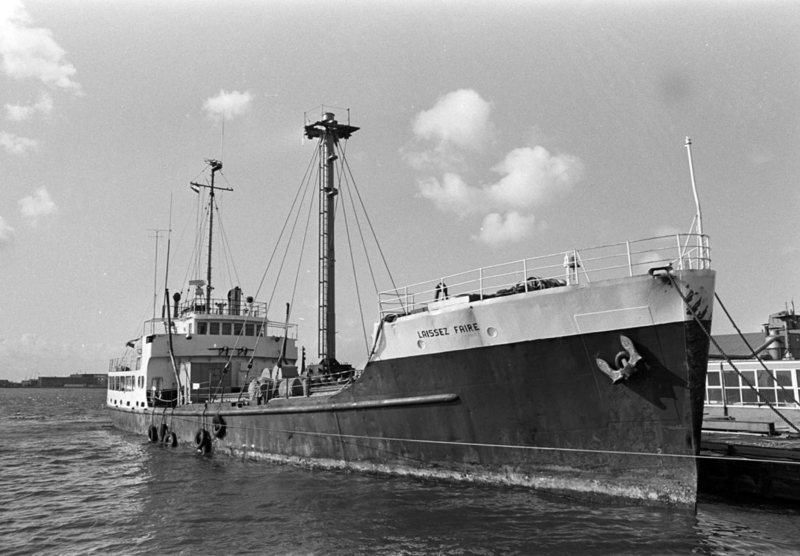 Here the ship was moved to another qua in winter 1960 (photo courtesy of Stichting Norderney). 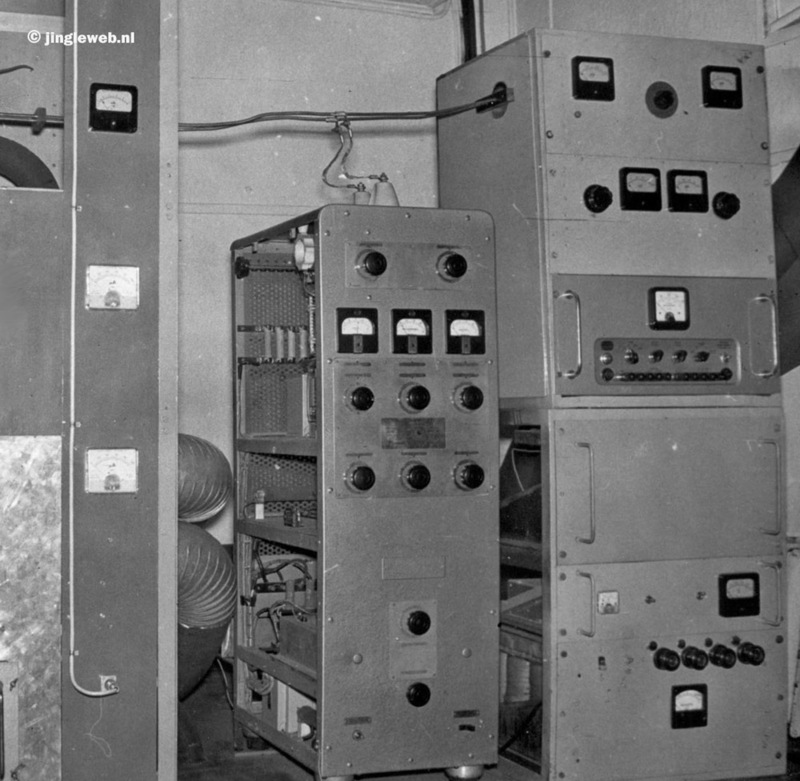 This was the old battery room of the light ship – it came in handy for the ship’s lights at sea. 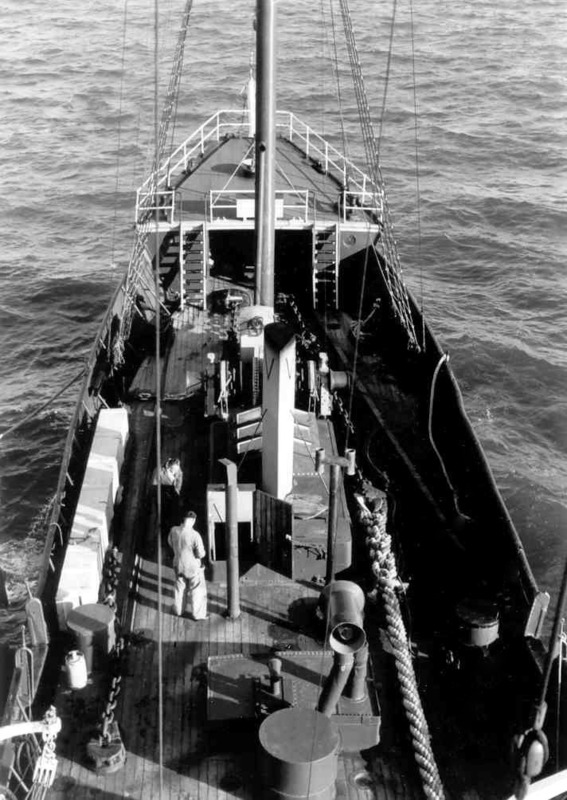 The umbrella anchor of the ship. 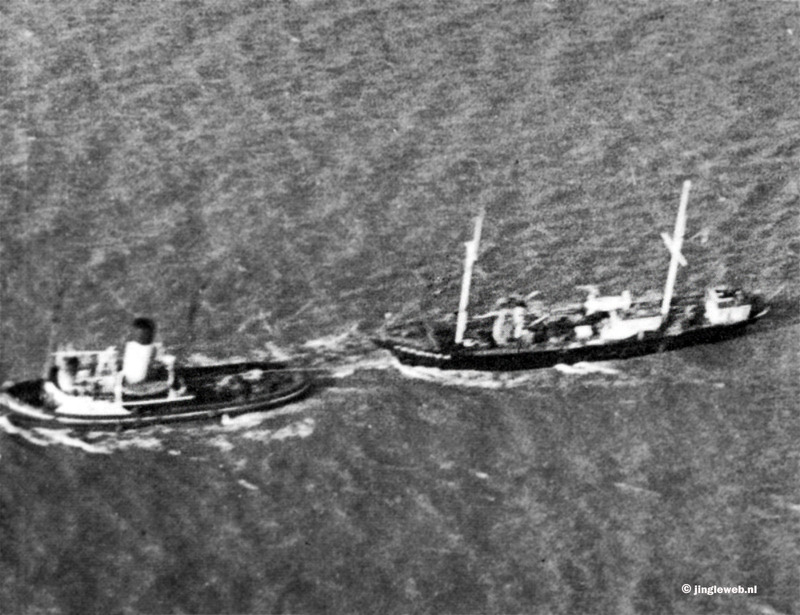 On april 18, 1960 the ship tried to sneak out of Emden. 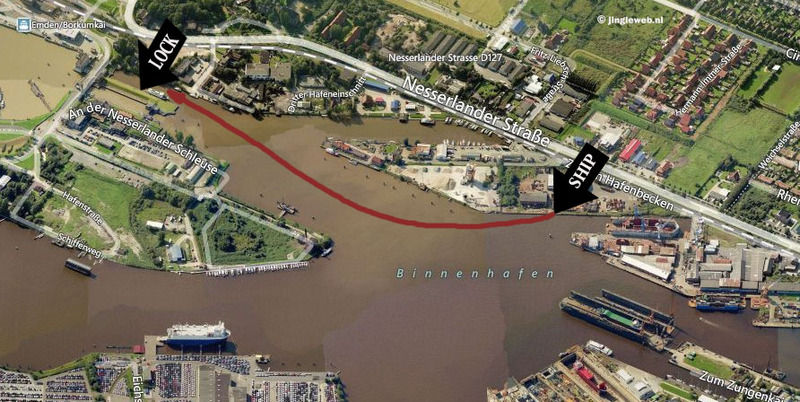 It was only 500 meters from the Cassens werft where it was fitted out. 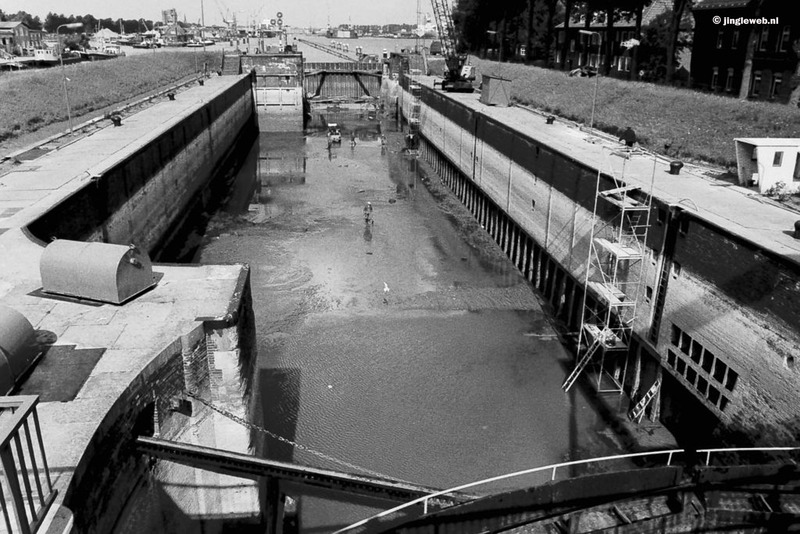 But the German’s emptied to dock to stop the ship, like here when the lock was partley restored in 1974. 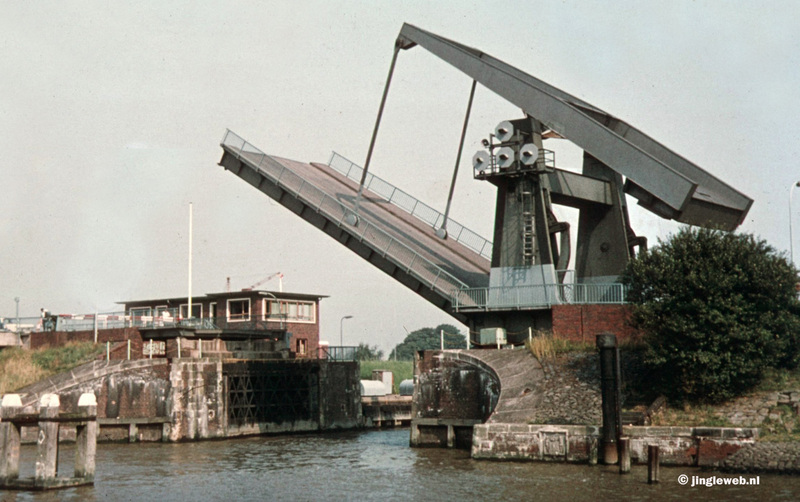 They put down the bridge deck too. 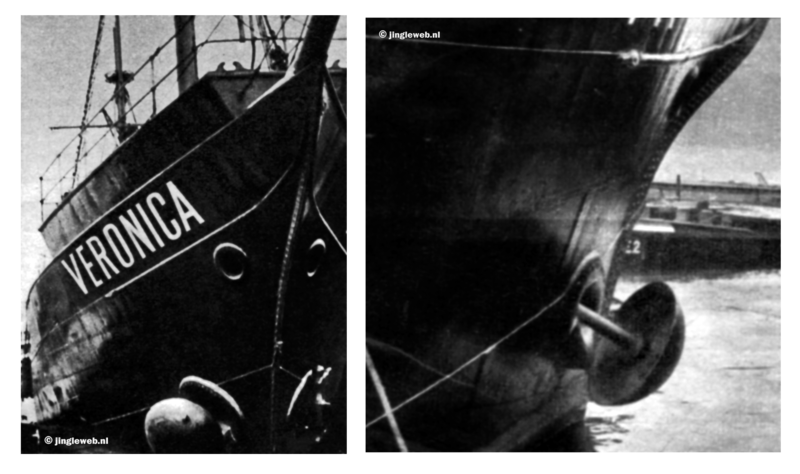 The ship was seized by the police but the brave English captain of their tugboat Guardsman succeeded to get the ship out. 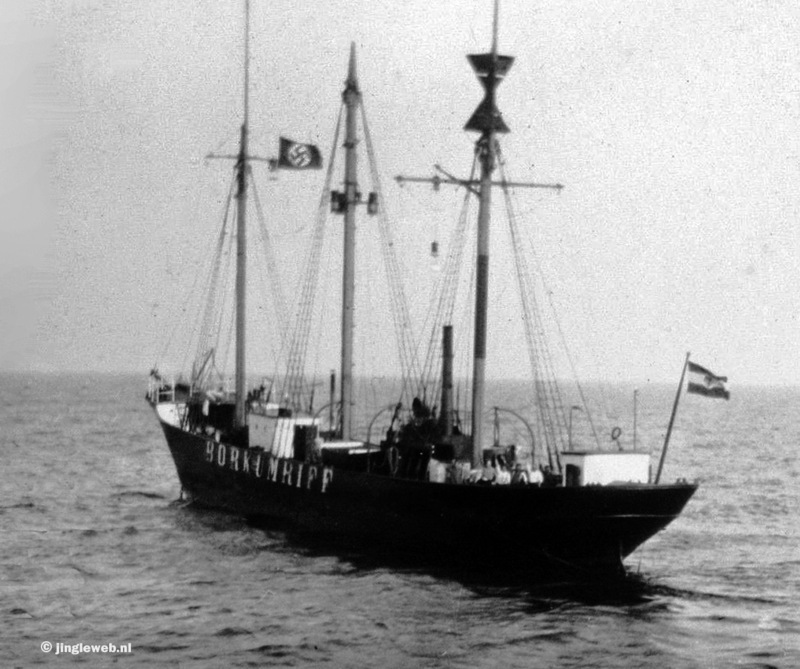 The ship on its way to the Northsea. 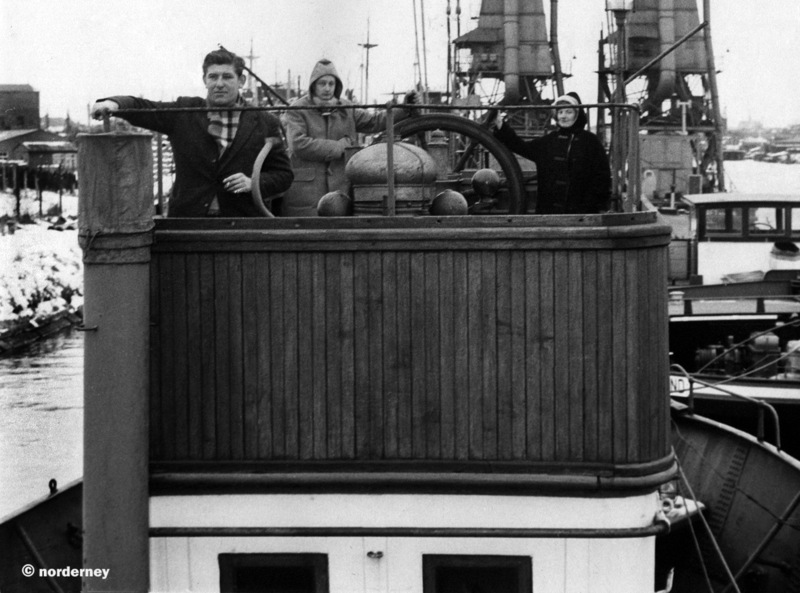 Closely monitored from a plane by the new owners. 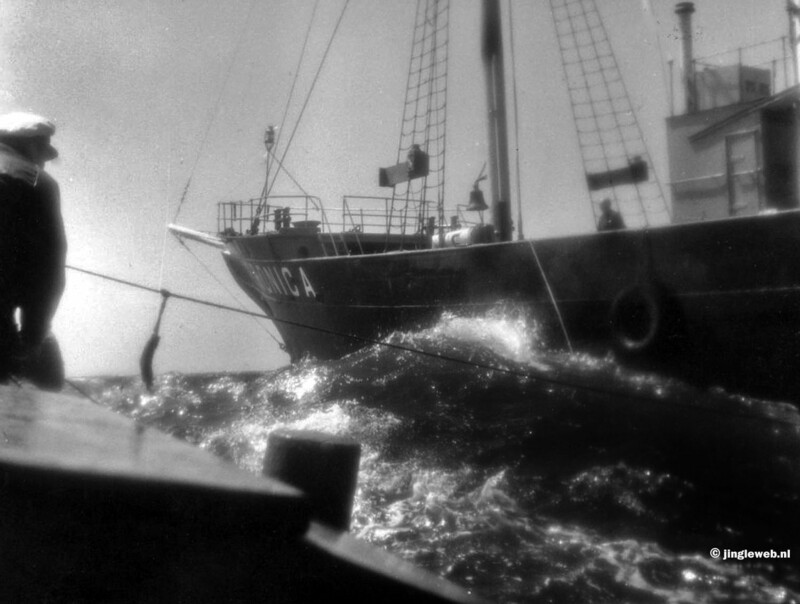 And there it was: on the high seas. 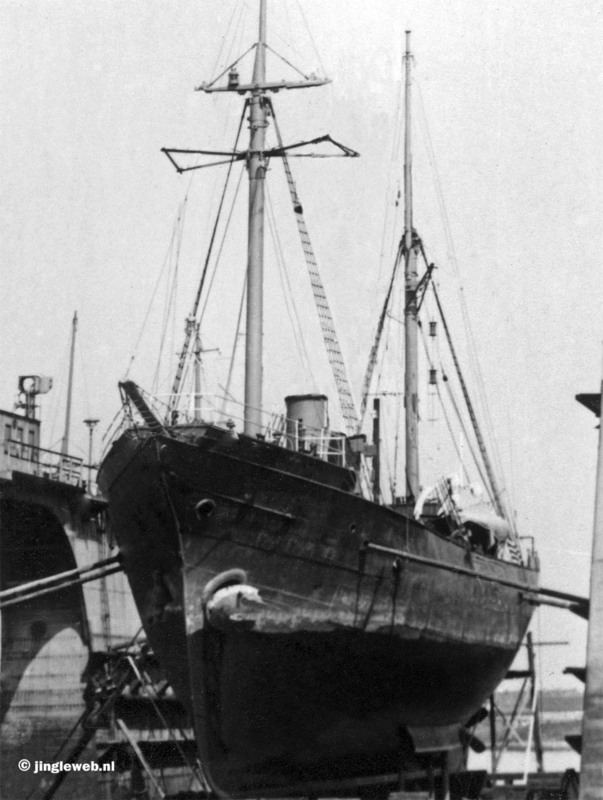 And what a romatic ship it was. 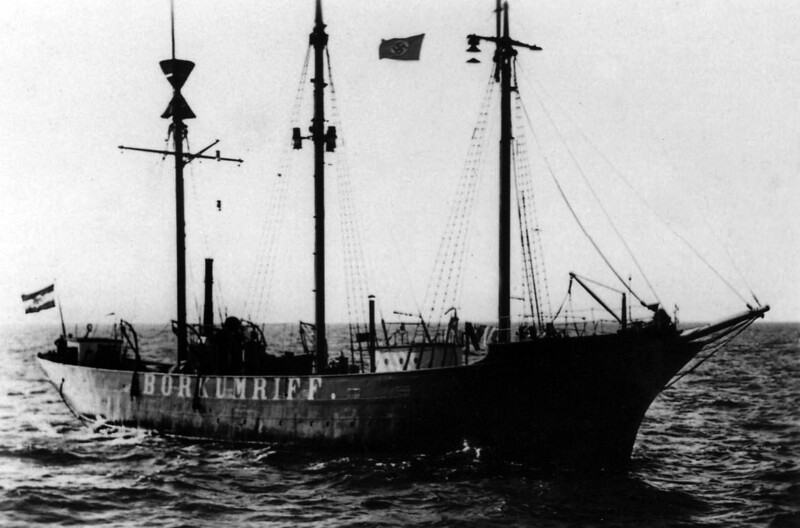 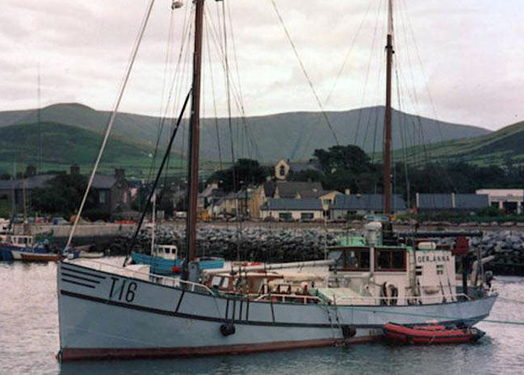 Being an old light ship, the Borkum Riff had a superb anchorage system. 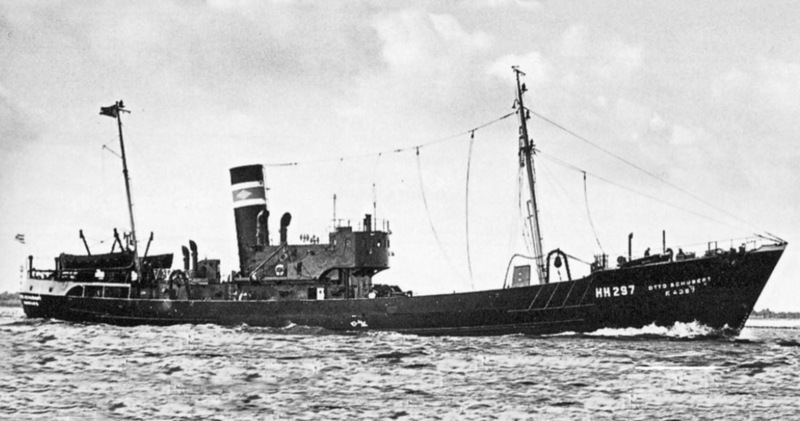 Like it did while it was still a lightship. 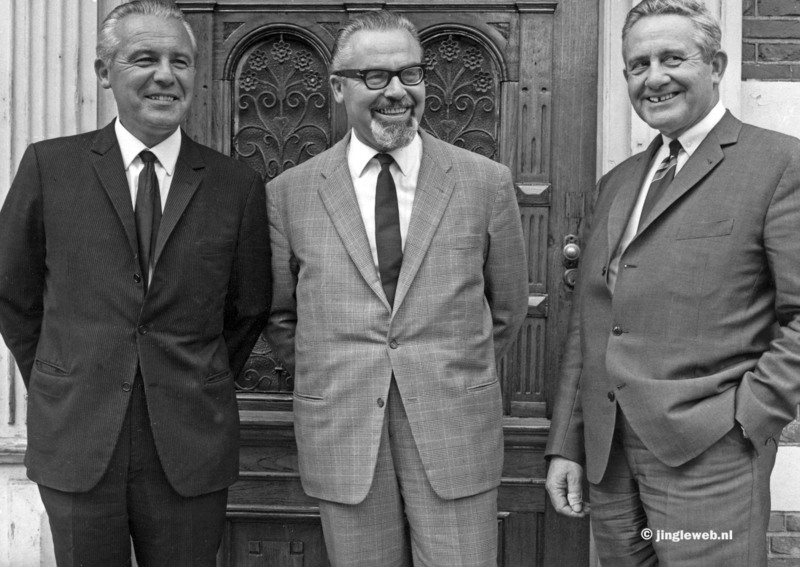 Soon their first theme tune became: Ted Heath and His Music – Swingin’ Shepherd Blues. 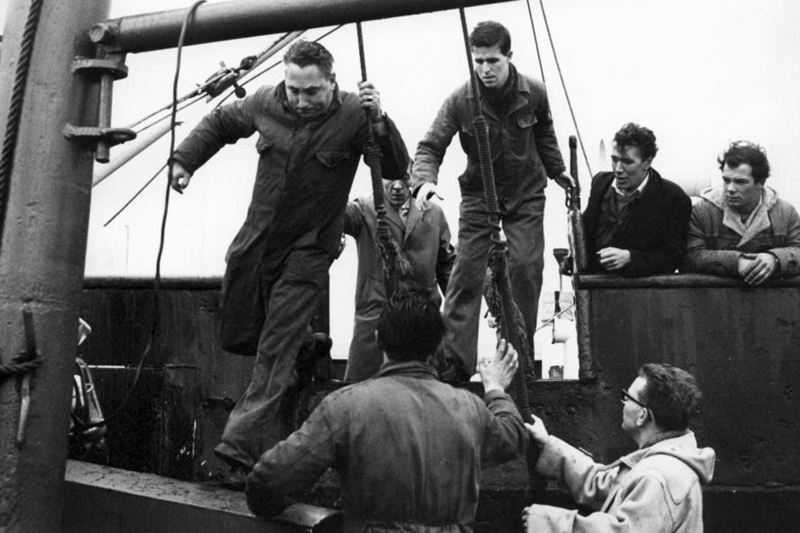 Bringing out supplies with the first tender: Scheveningen 26 of skipper Jan Groen. 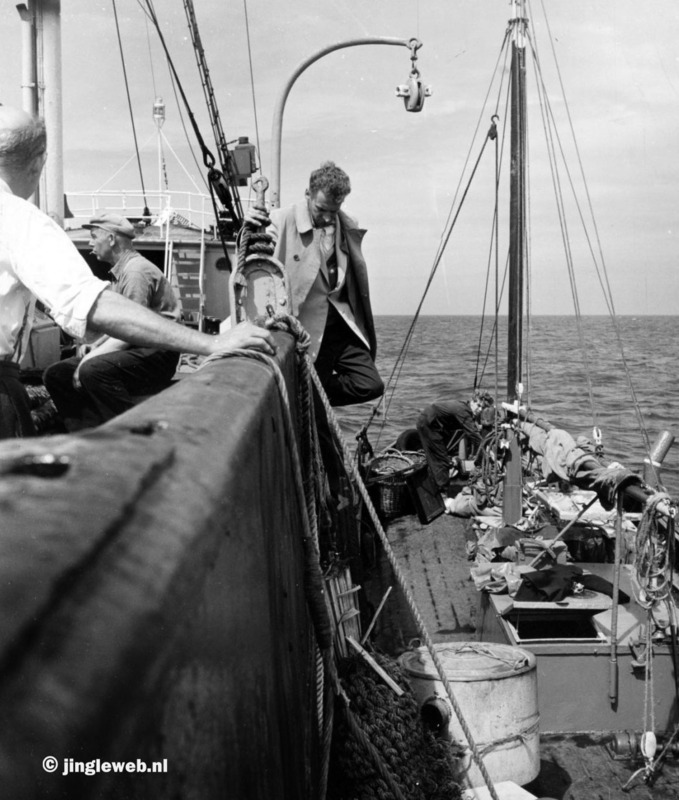 And a crew was found, here in a change of shift. 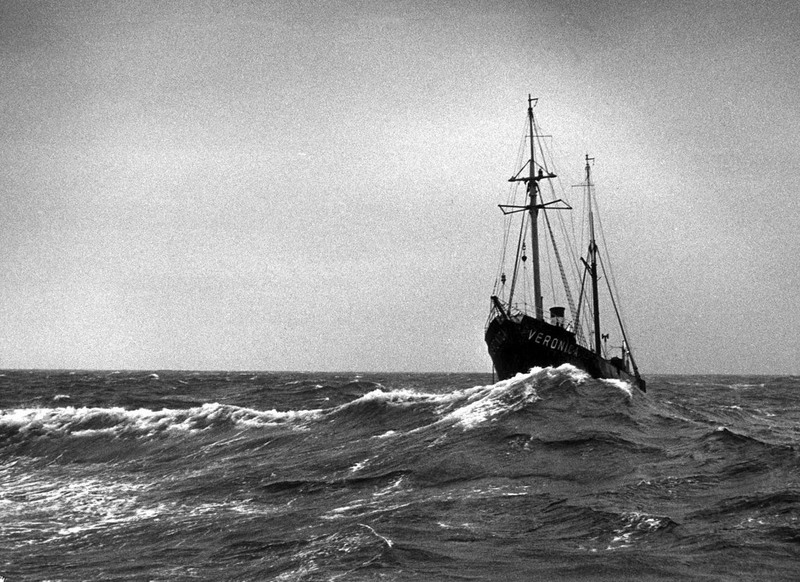 Which could be tricky in bad weather. 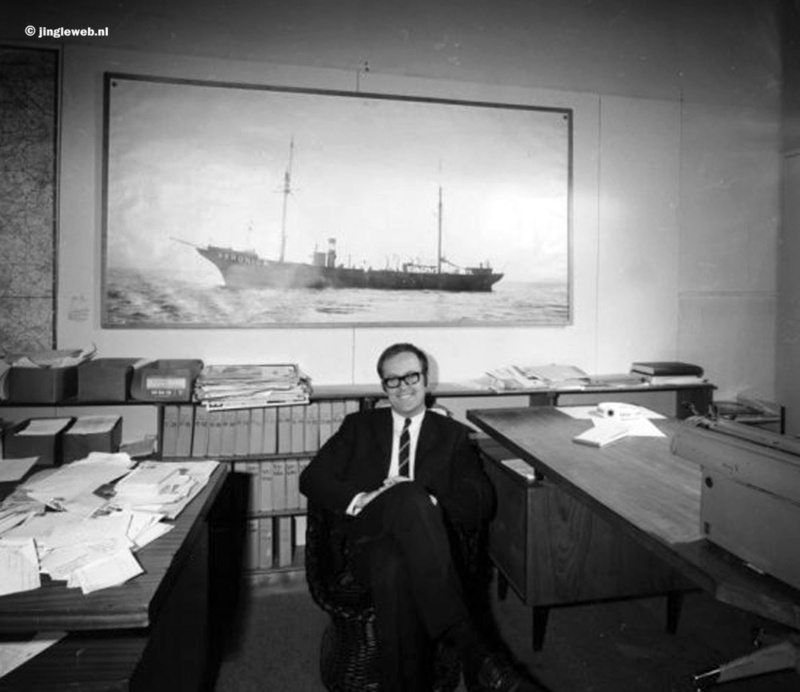 The custom office wanted to check every tape before it went out the this devious ship off the Dutch coast. 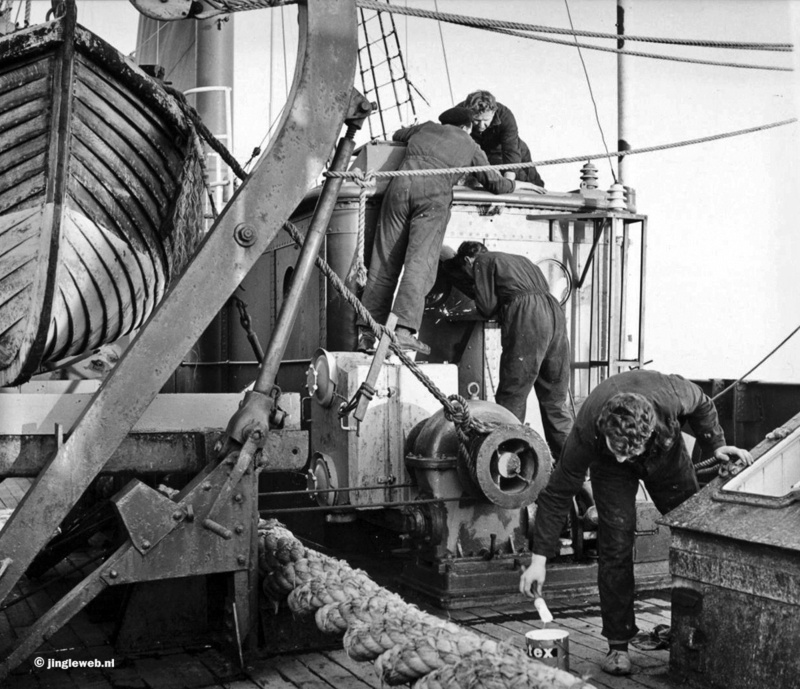 And at sea there was a lot of extra surveyance. 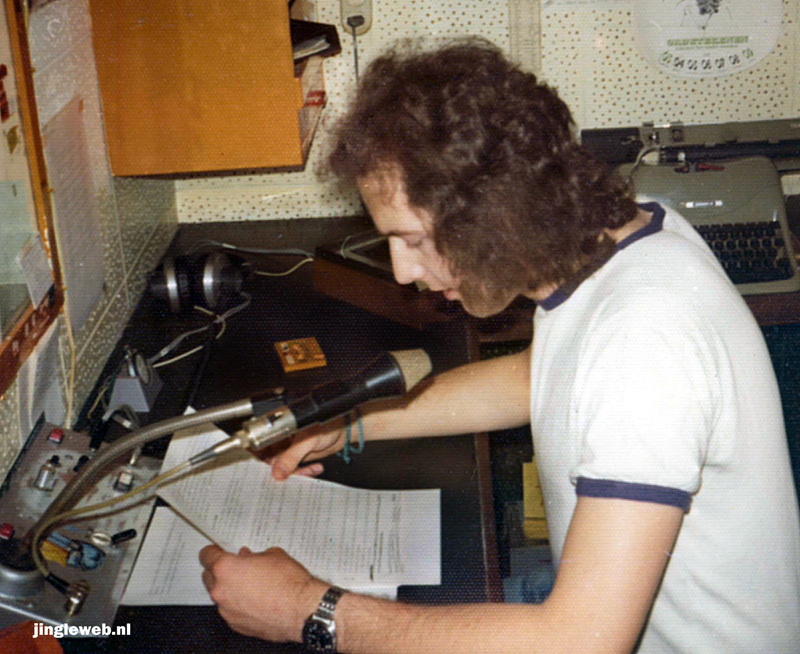 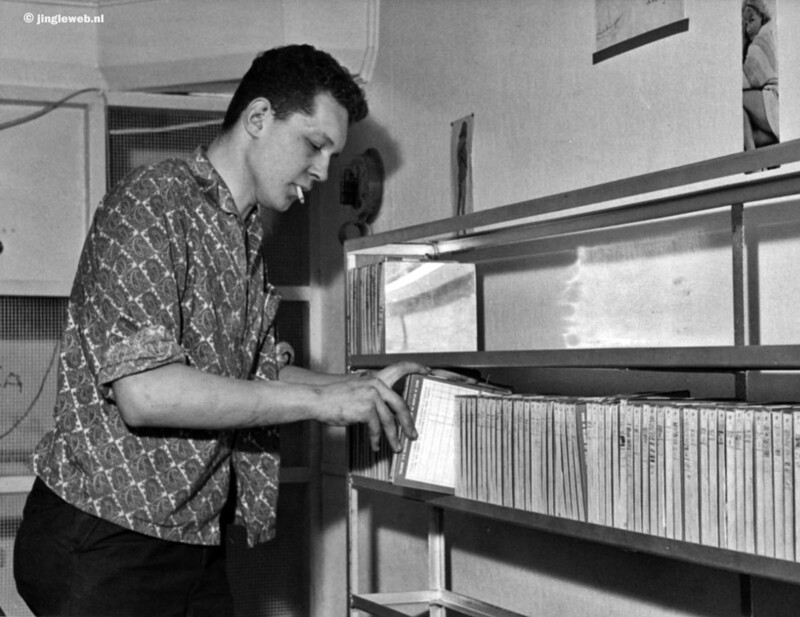 Here’s Oswald at home in Amsterdam, finally pickup up the first ever test signal of the ship. 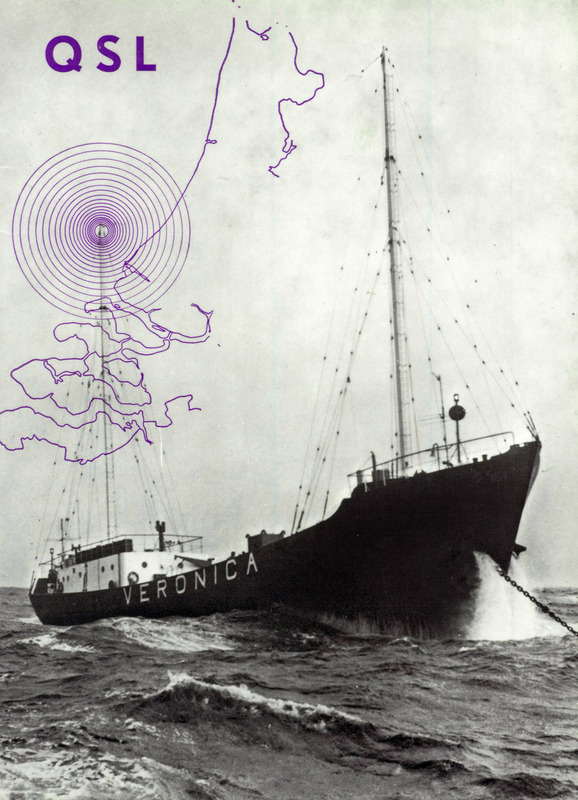 From this make shift transmitter. 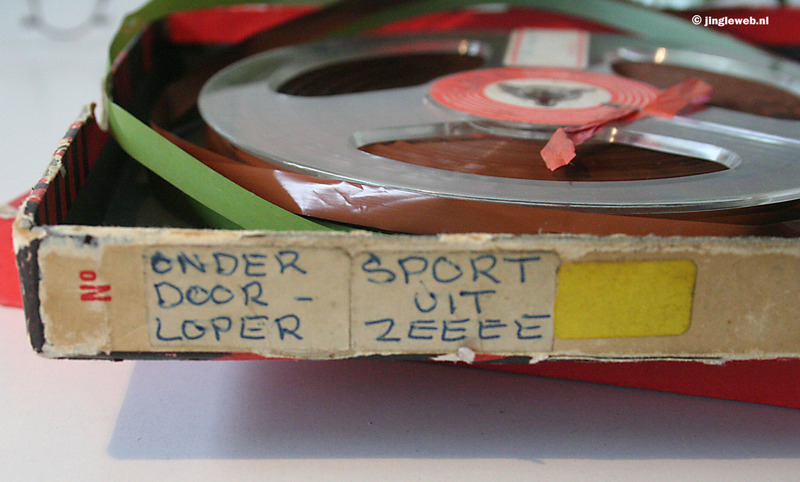 On April 21st, he pushed in the button the start the first ever official program on tape. 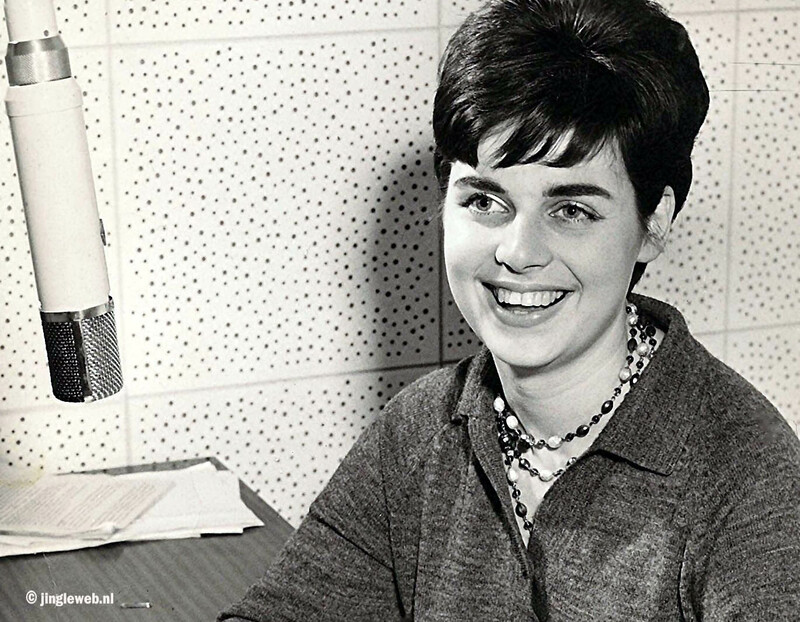 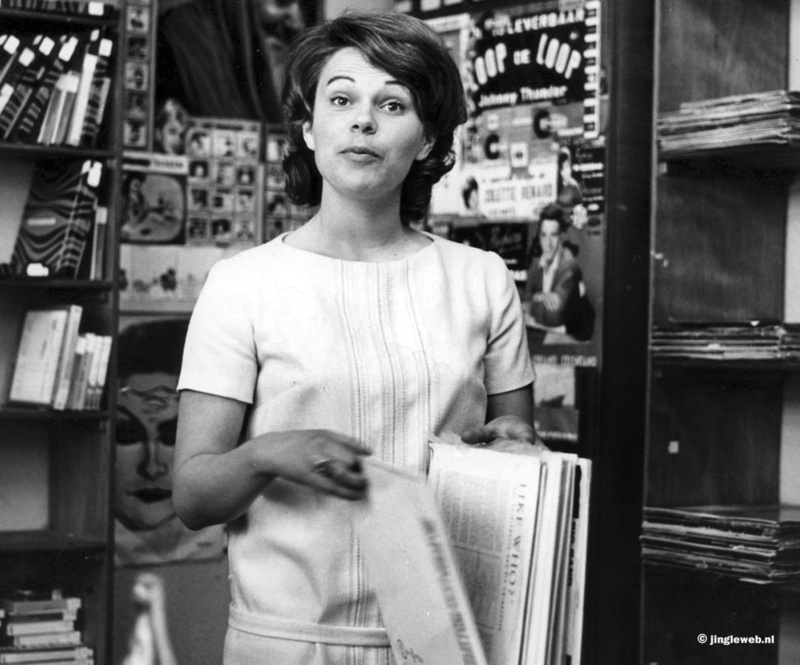 Ellen van Eck was the first voice officially heared. 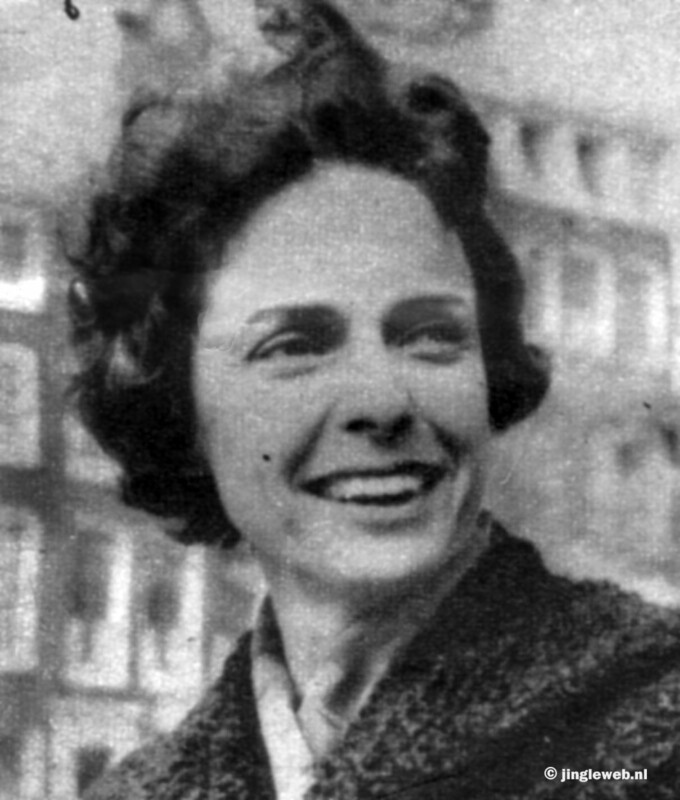 It’s her again, from an unknown newspaper photo. 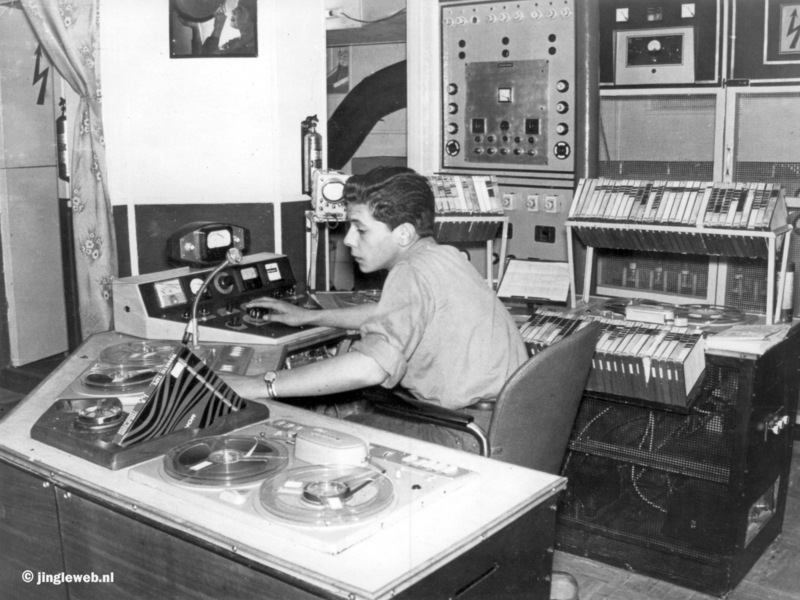 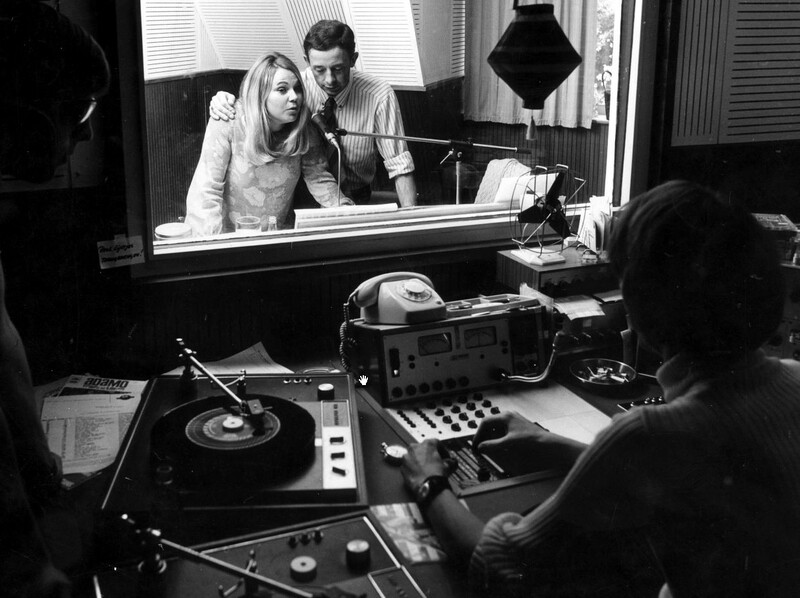 Their first – simple studio aboard. 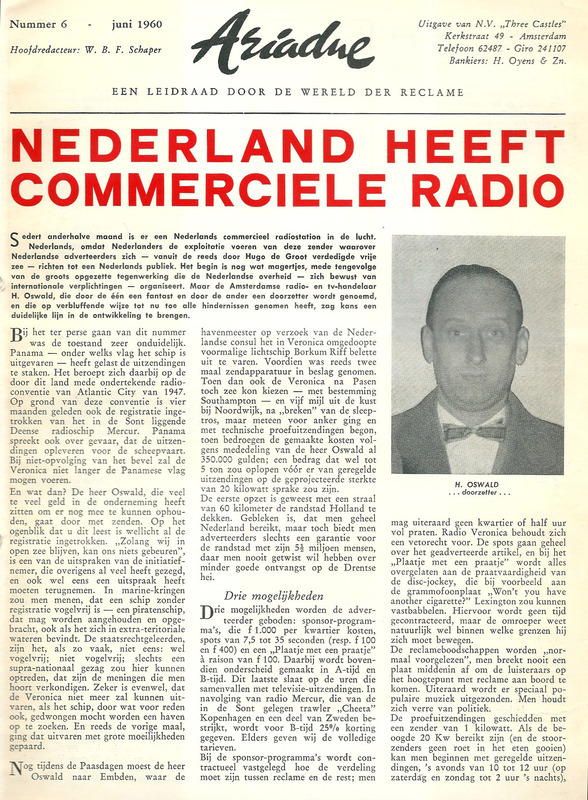 Here´s another on from the same series, with Cees Baarda and Maarten van der Harst (kindly supllied by Stichting Norderney). 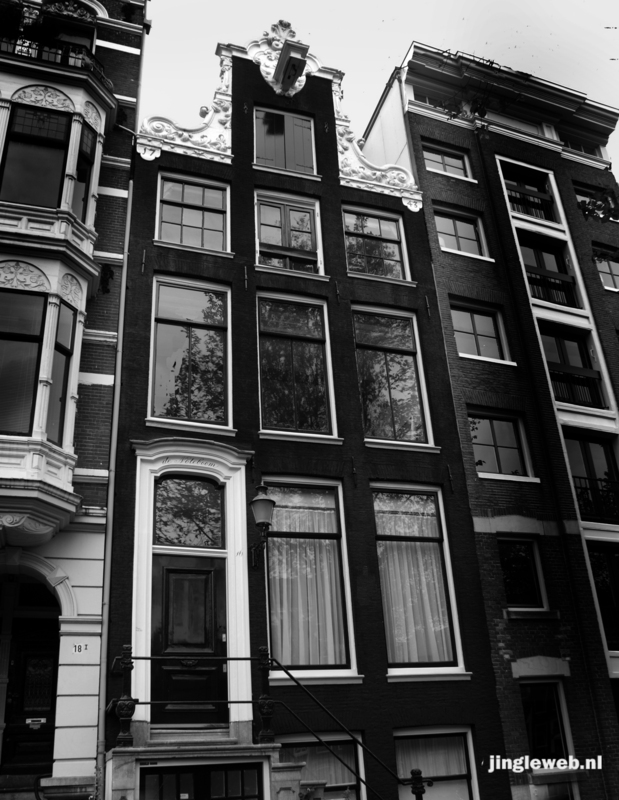 This is where the first land studio was: in Amsterdam, at the Keizersgracht 16. 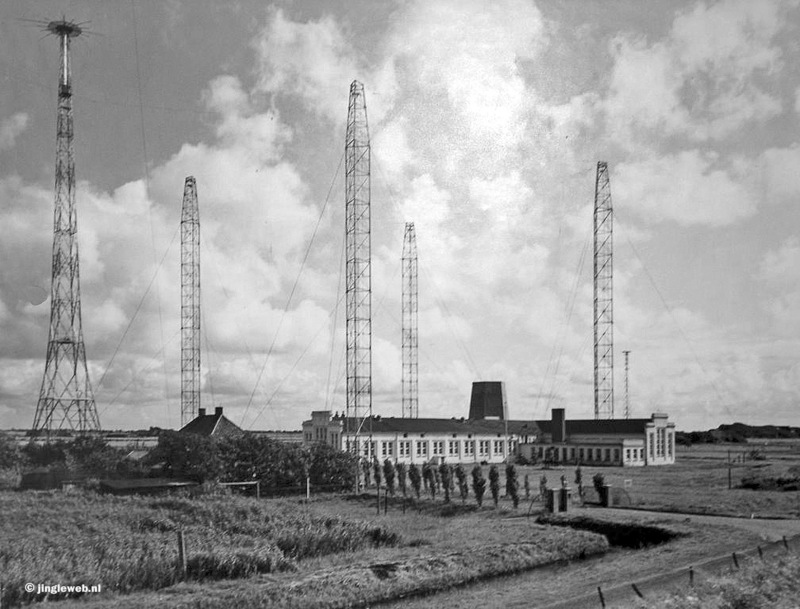 This is was the HQ of het Nederlands Laboratorium voor Filmtechniek. 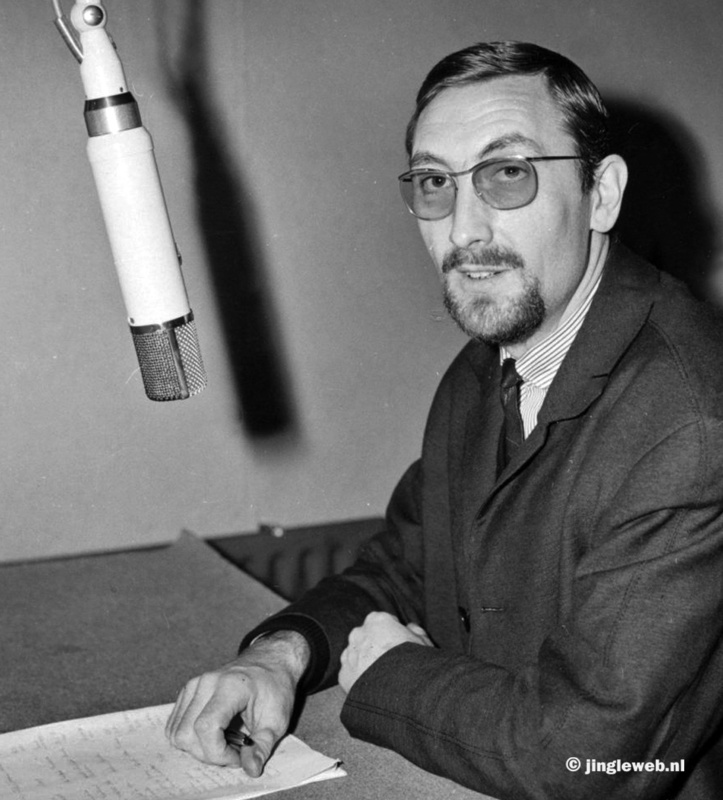 Max Groen was one of their first announcers. 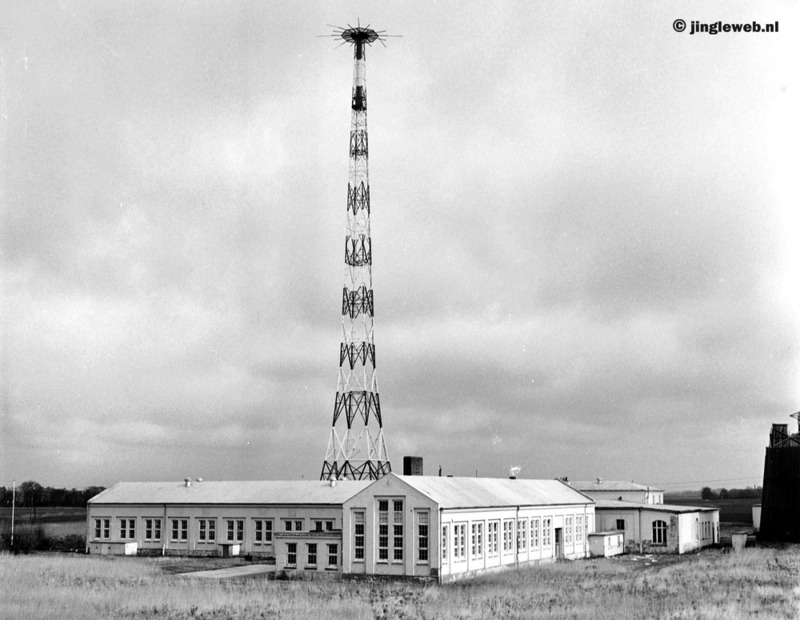 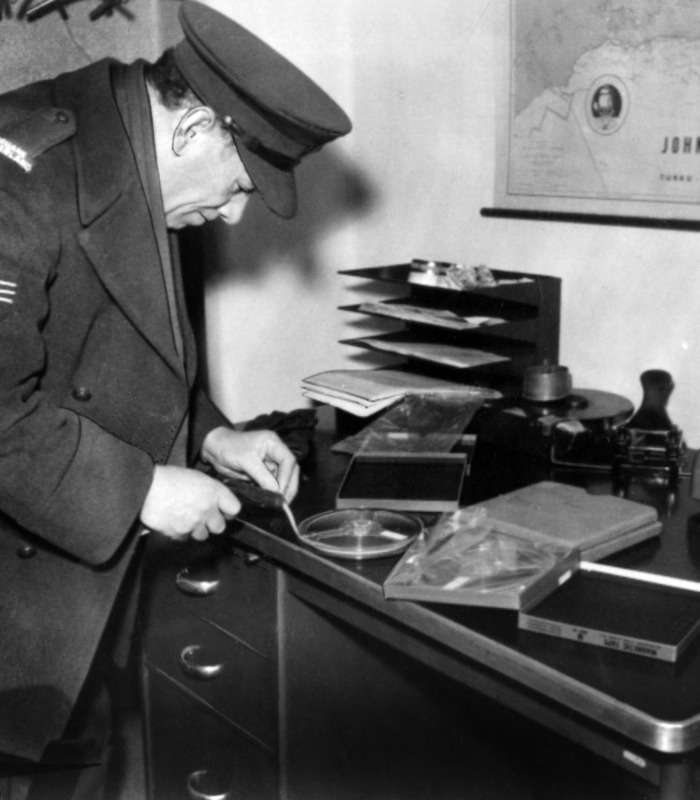 In the first few weeks the station was jammed by a German navy station in Norddeich. 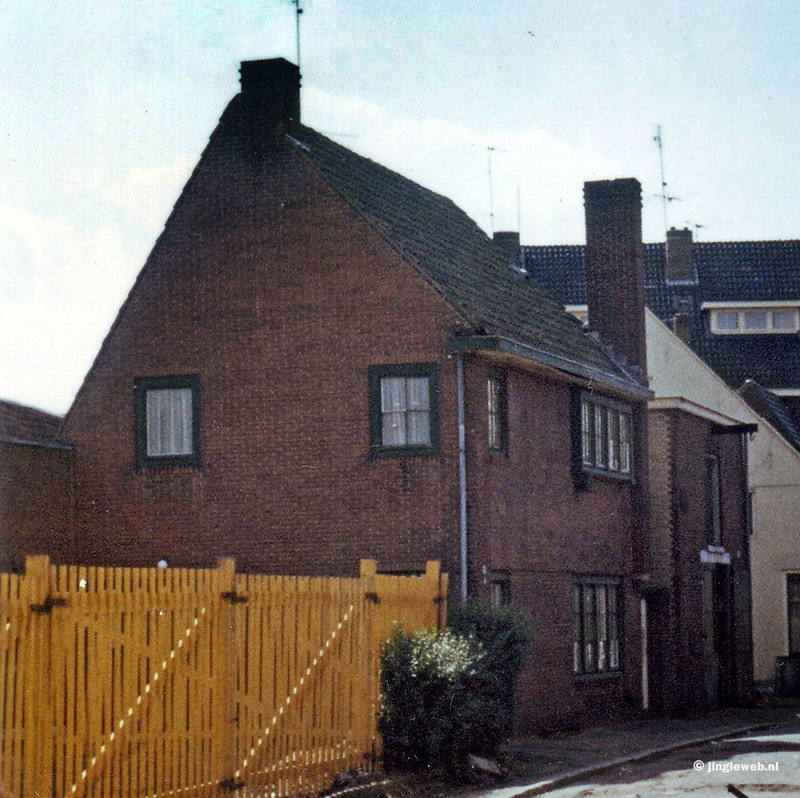 It turned out the Germans did it on a Dutch request. 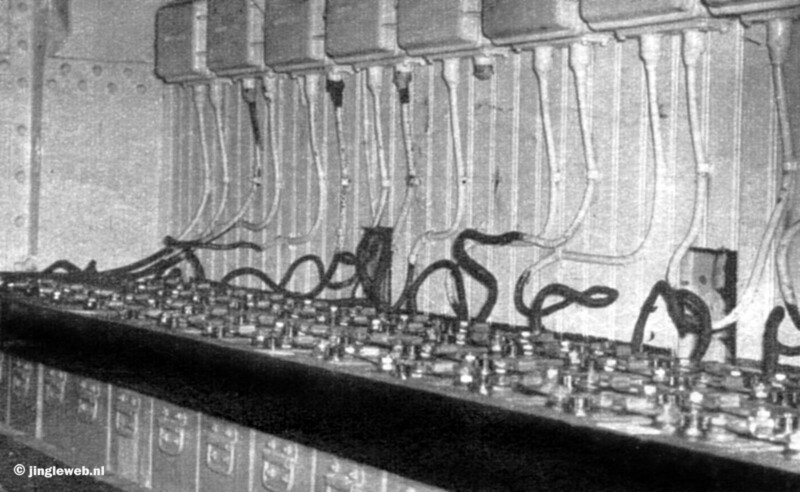 But soon reception was getting better and a logistic system of tapes from land being played on board was set up. 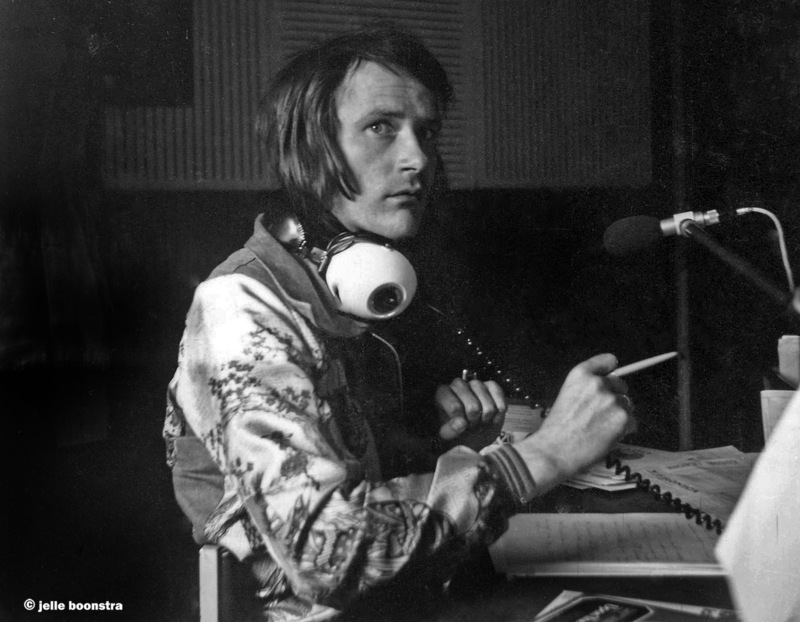 The brother Verwey took over and from now on programmes were made on the Zeedijk in Hilversum. 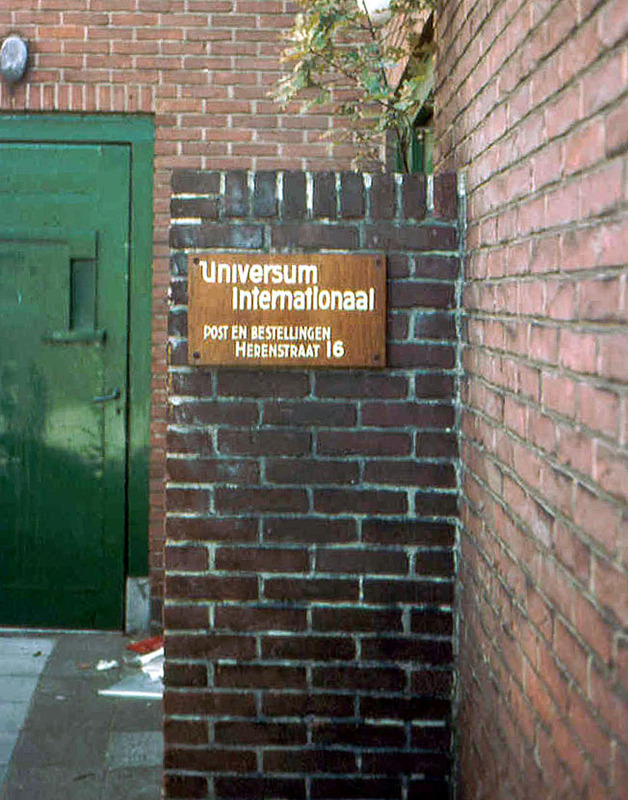 The building was shared with Universum. 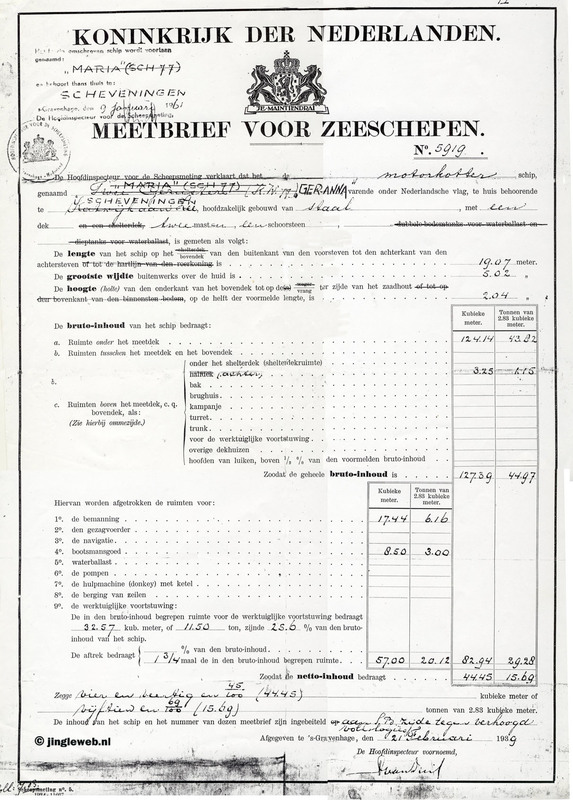 The letterhead of the company on the new adress. 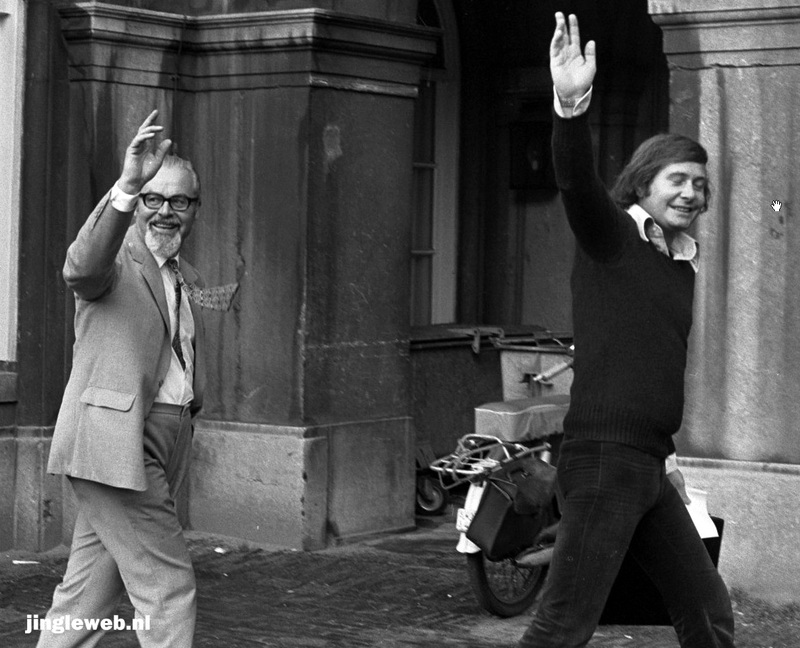 Here are Jaap, Bull and Dirk Verwey. 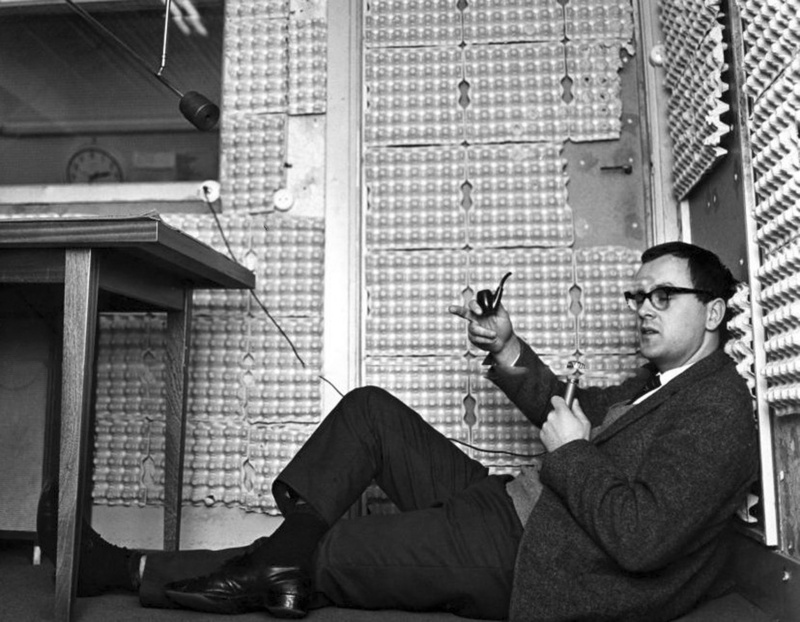 At a later date studios and offices moved to Hilversum – here with Joost de Draaijer – and some soundproofing of the poor. 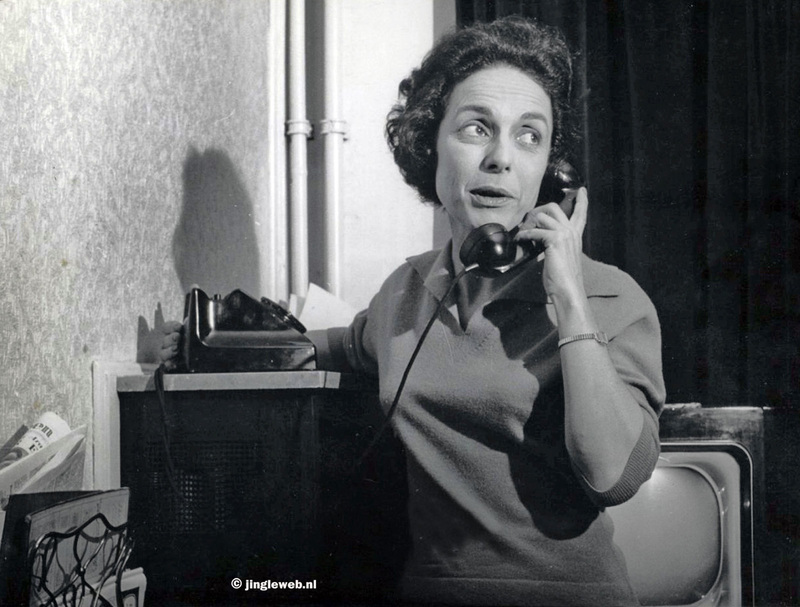 Here’s Tineke in the same building. 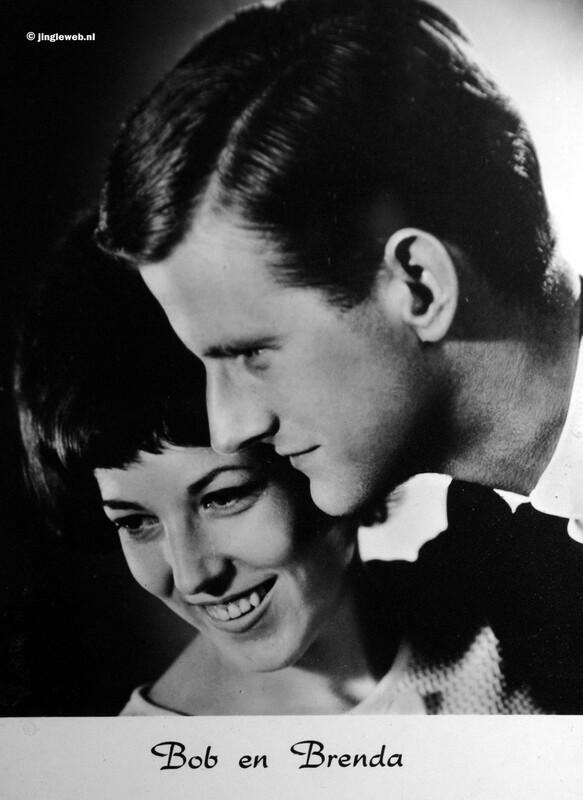 Bob (Krijn Torringa) and Brenda. 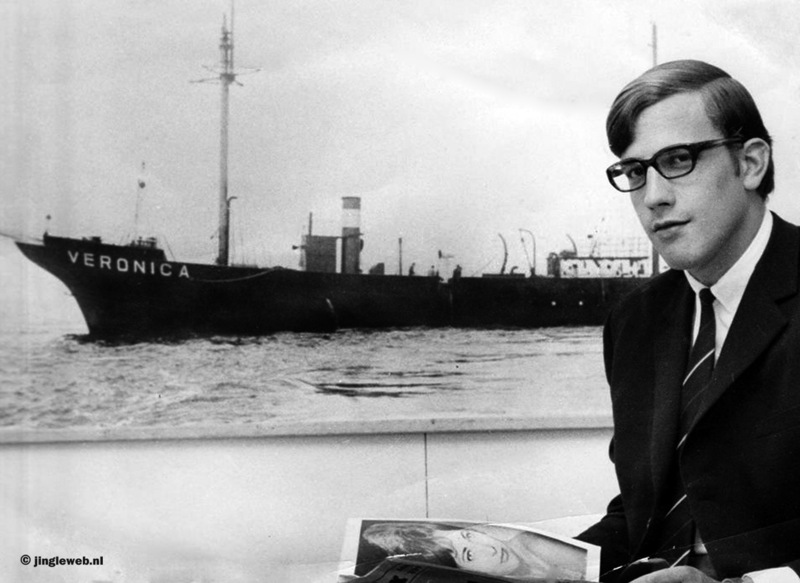 This is how the press looked at Veronica, they didn’t really predict a long an bright future. 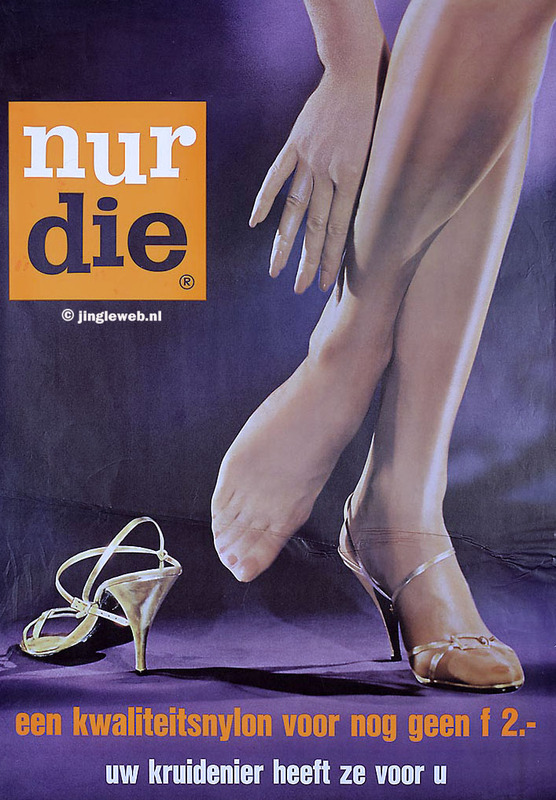 In 1962 advertisers poored in after a Nur Die commercial had been a convincing success. 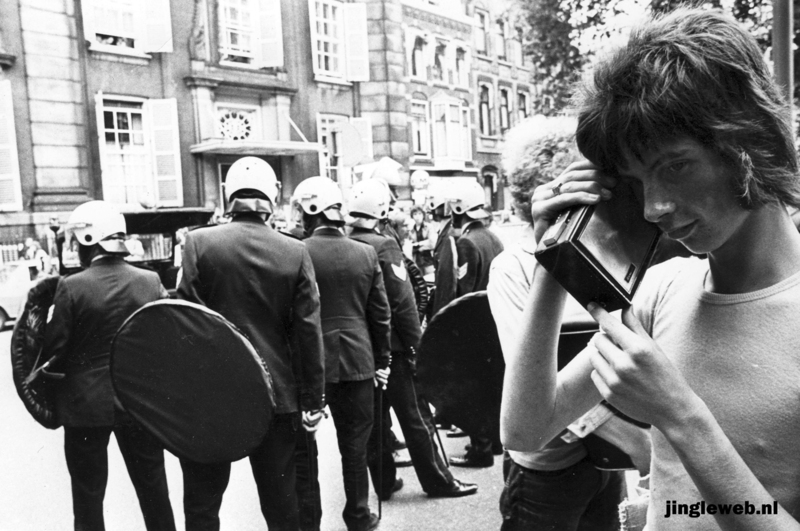 And suddenly it was becoming the goldmine that everyone expected. 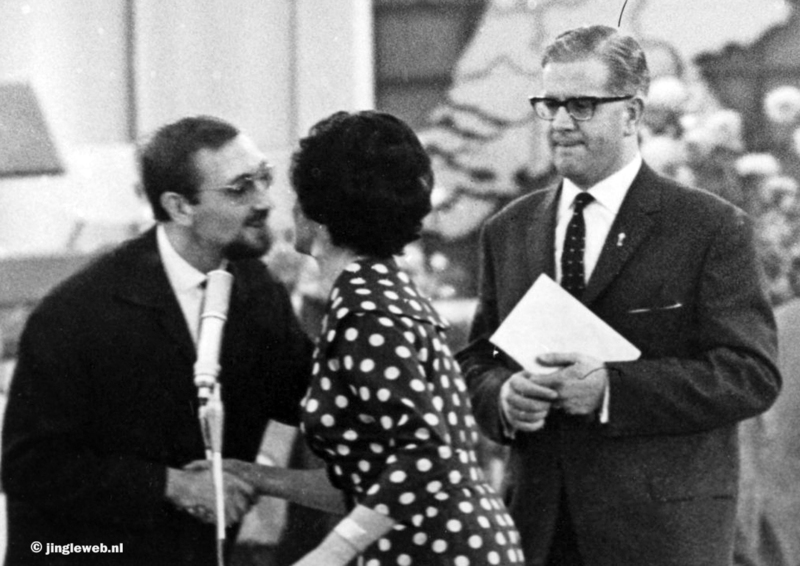 Soon they did charity, like the famous Open Het Dorp (Tony Vos kisses host Mies Bouwman), in which they donated 140.000 guilders, six times the amount of Heineken. 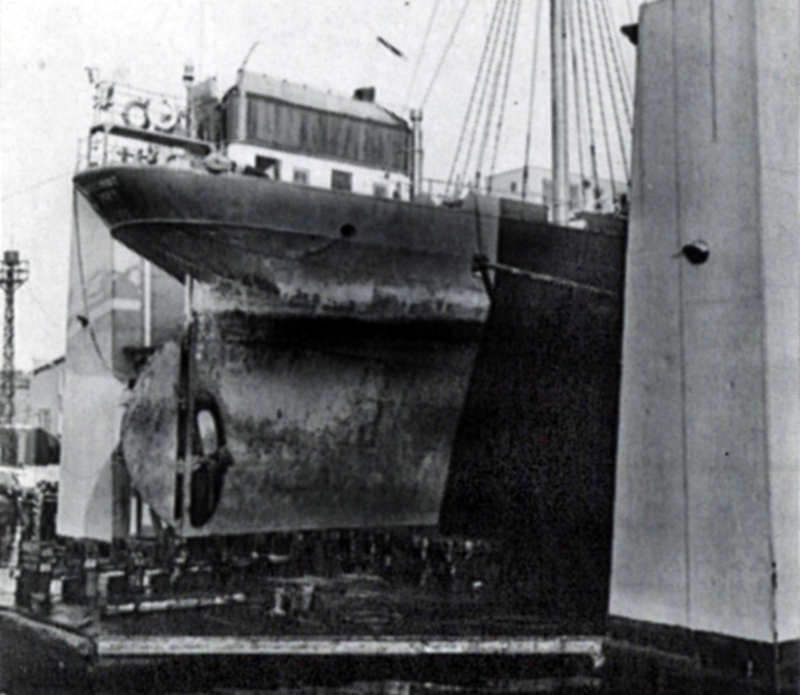 The regular maintenance improved the ship quite a bit. 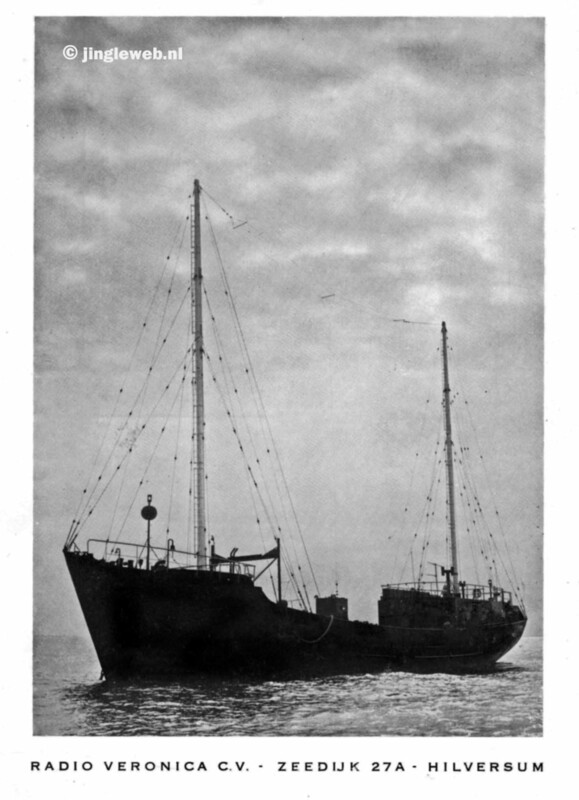 And to secure a regular supply of food they’d bought an own tender too. 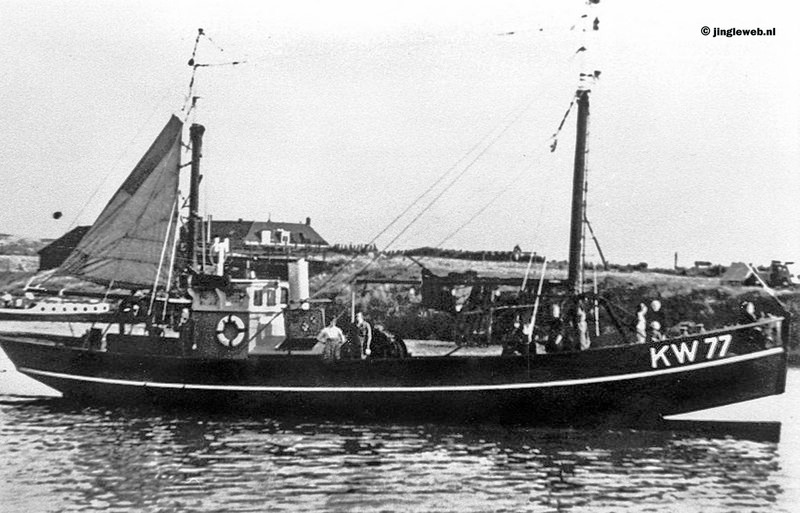 It was the formal Katwijk trawler KW77. 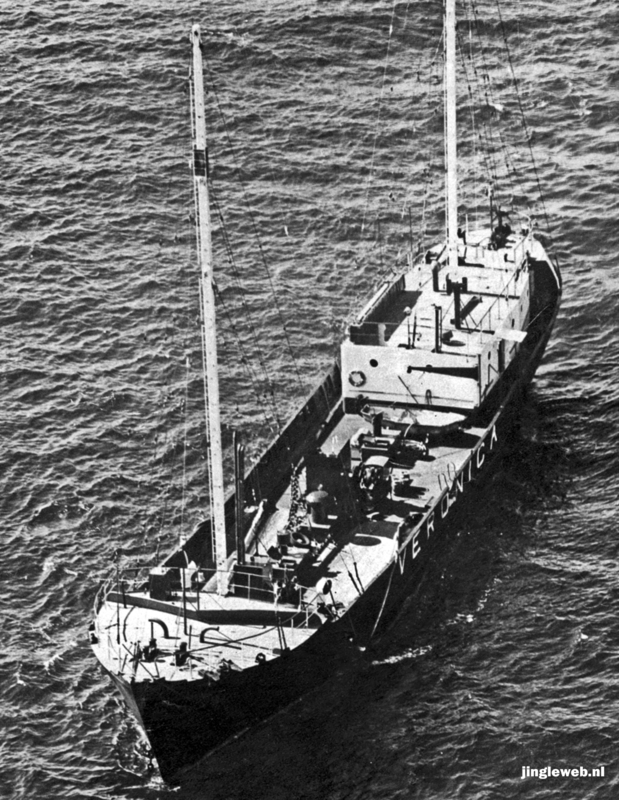 Still floating by the way in England as a private yaught. 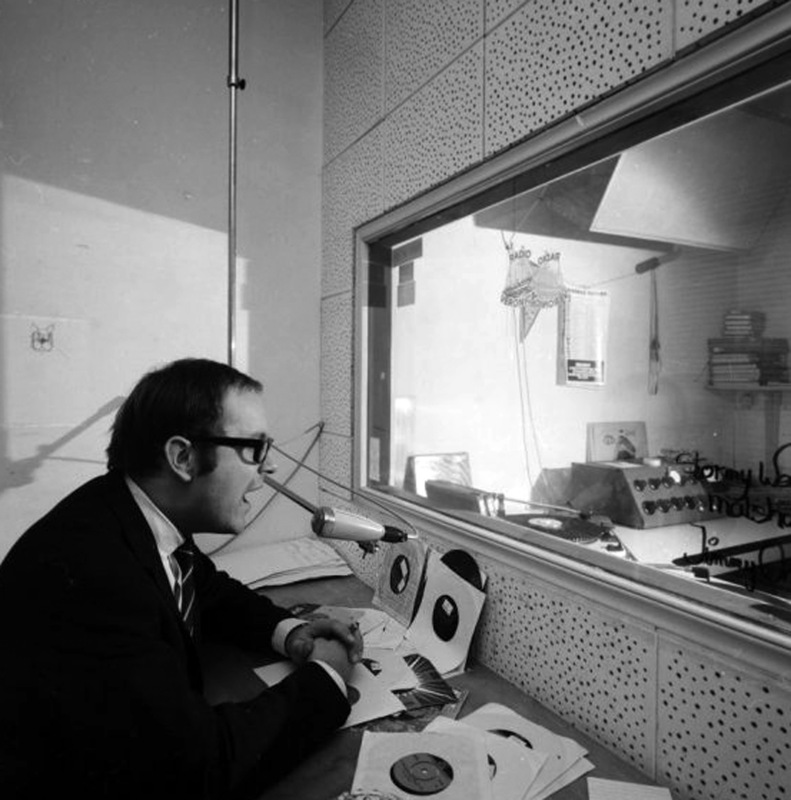 The studios were getting better too, here with technician André de Vries. 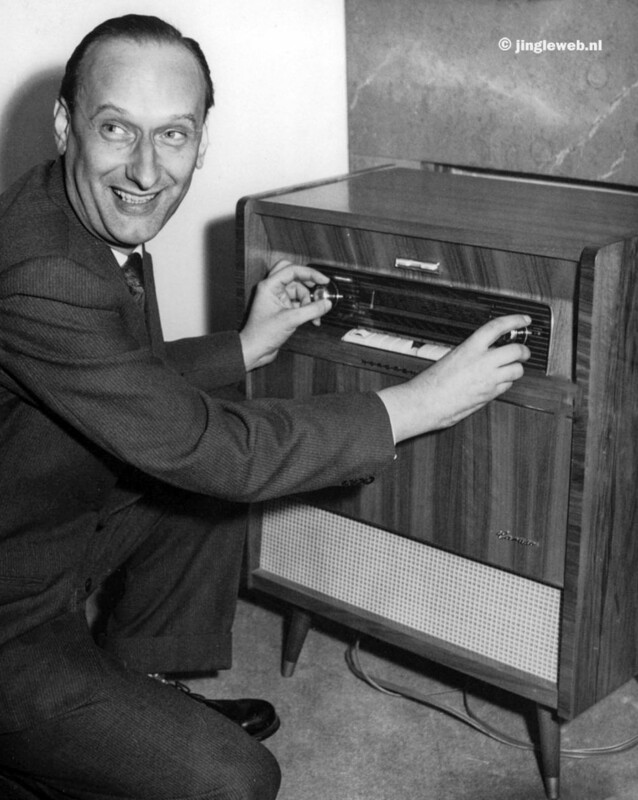 Jingles and commercials where played from tapes like these. 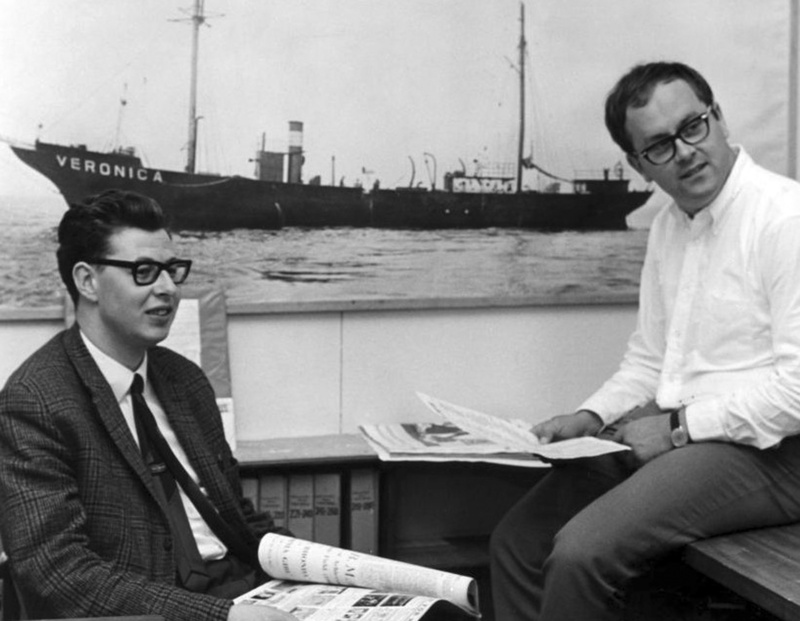 Program manager was Willem van Kooten (a.k.a Joost de Draaijer), here with R&B DJ Harry Knipschild. 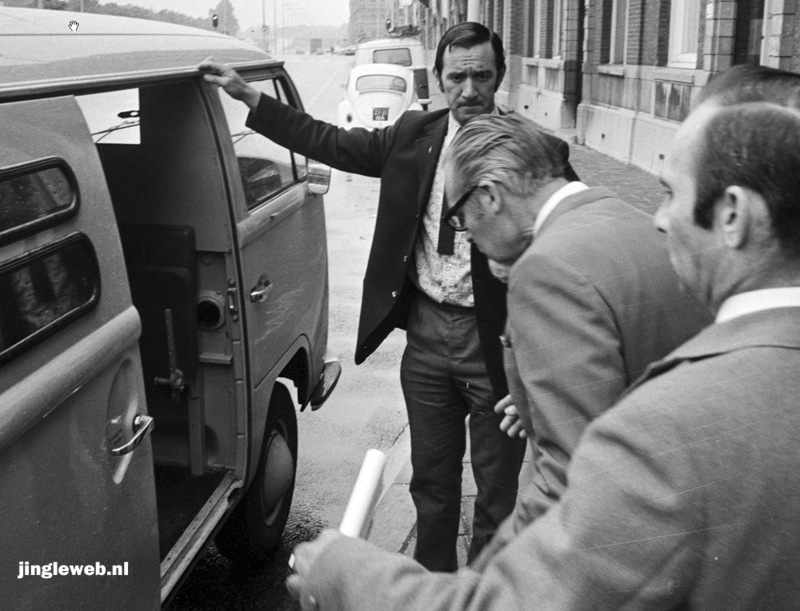 Ands here’s Jan van Veen on the very same spot, why are the dressed up so nice? 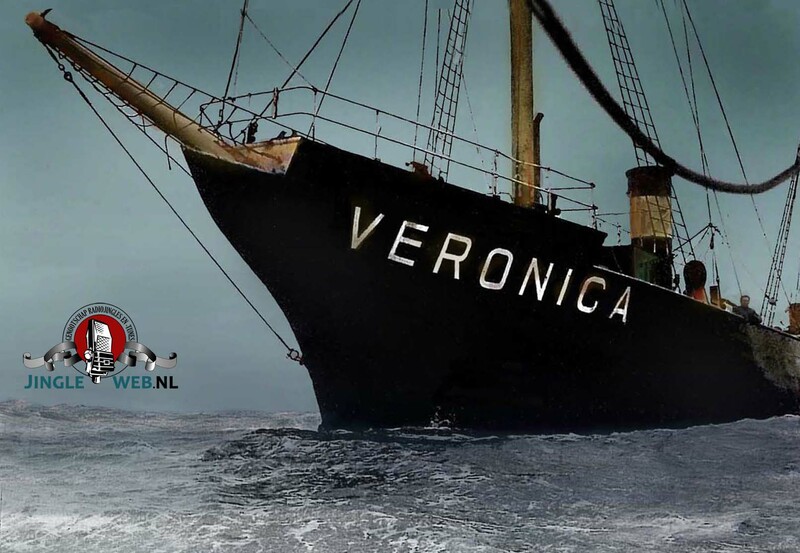 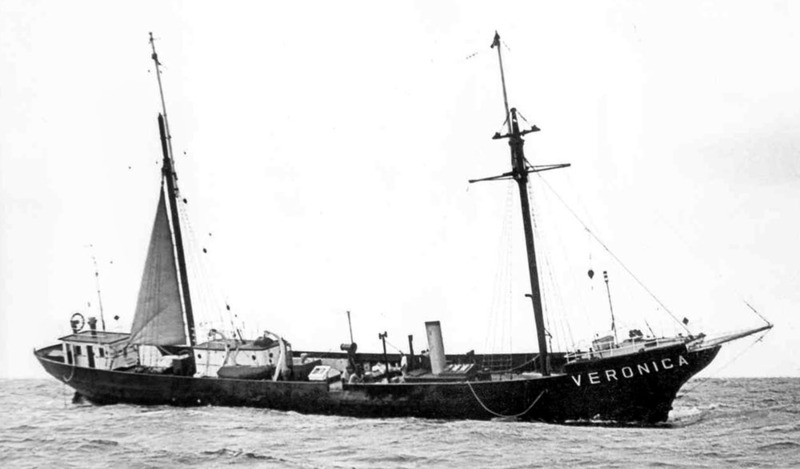 Veronica got itself a new ship in ’64, secretly fitted out in Zaandam. 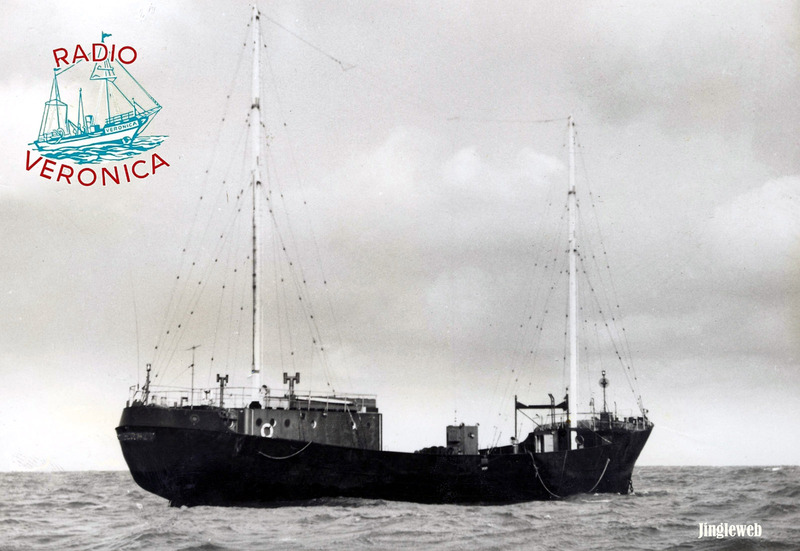 Here it is, on the first day at sea after it sneaked out of port – with no name on! 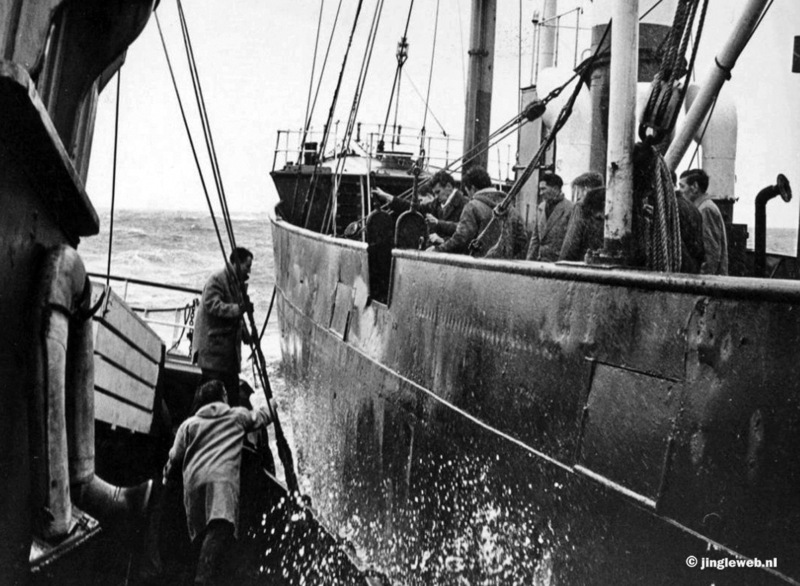 This is them, steaming up (it was a steam ship!) 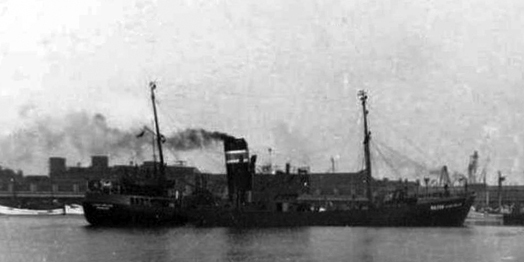 the Thames on this fuzzy photo. 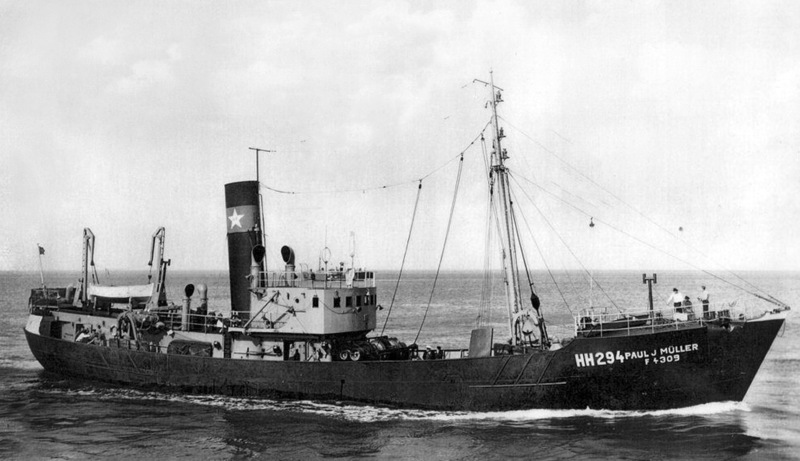 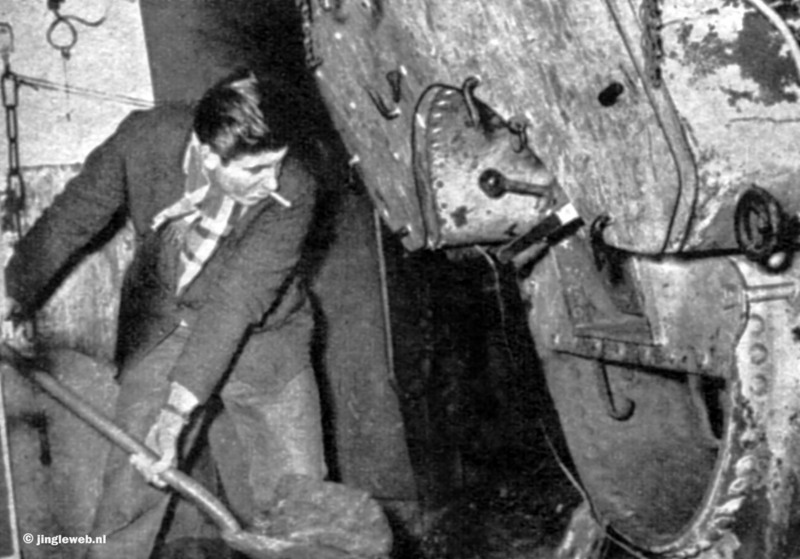 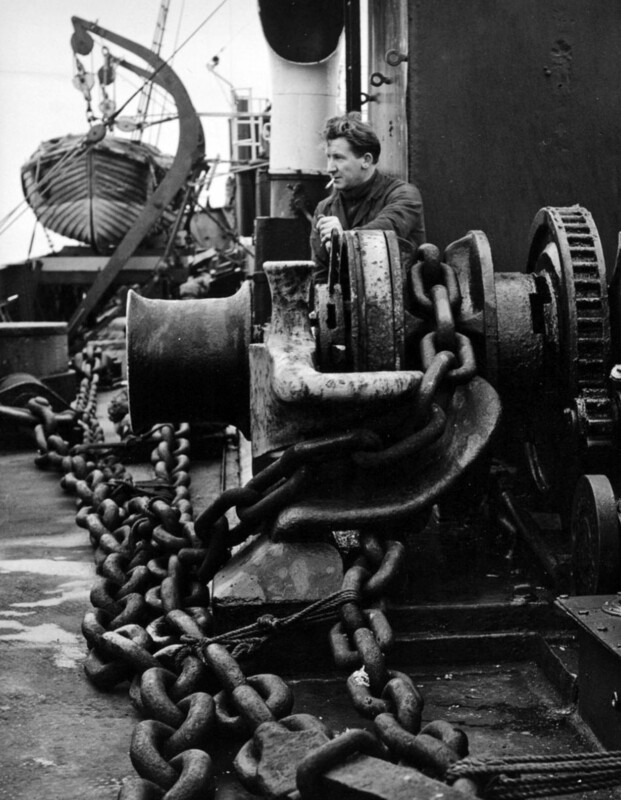 And this one: the HH294/Paul J. Müller, which they actually picked (photo from 1952). 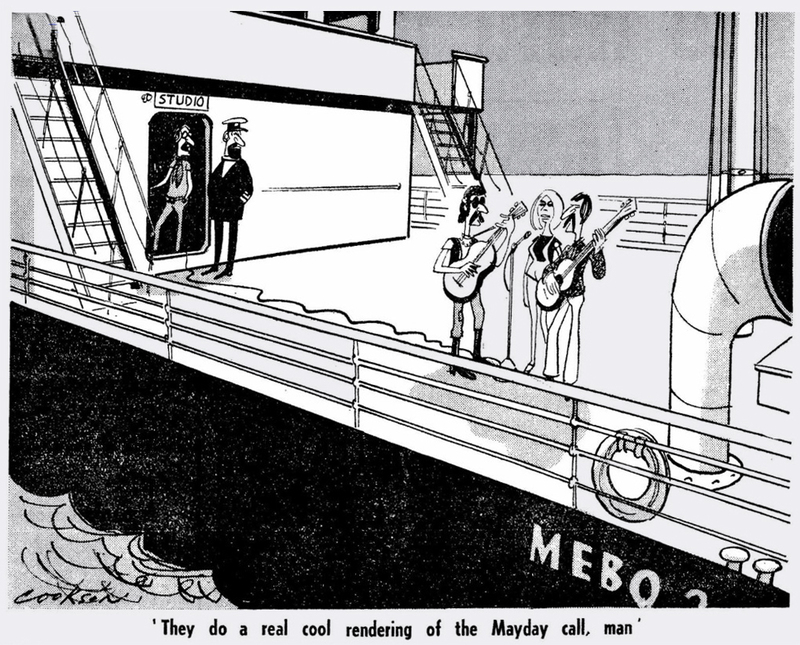 And the last one, from 1973. 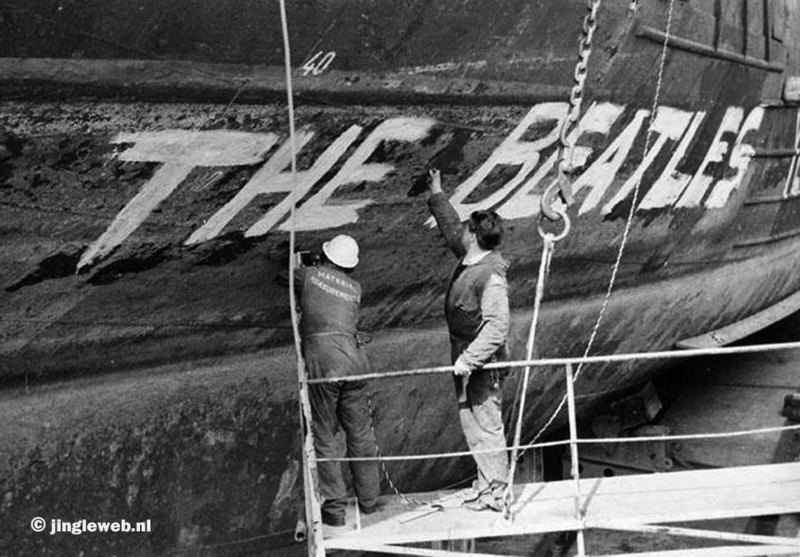 It’s a pity really the old ship hadn’t the name on the side, it would have looked like this. 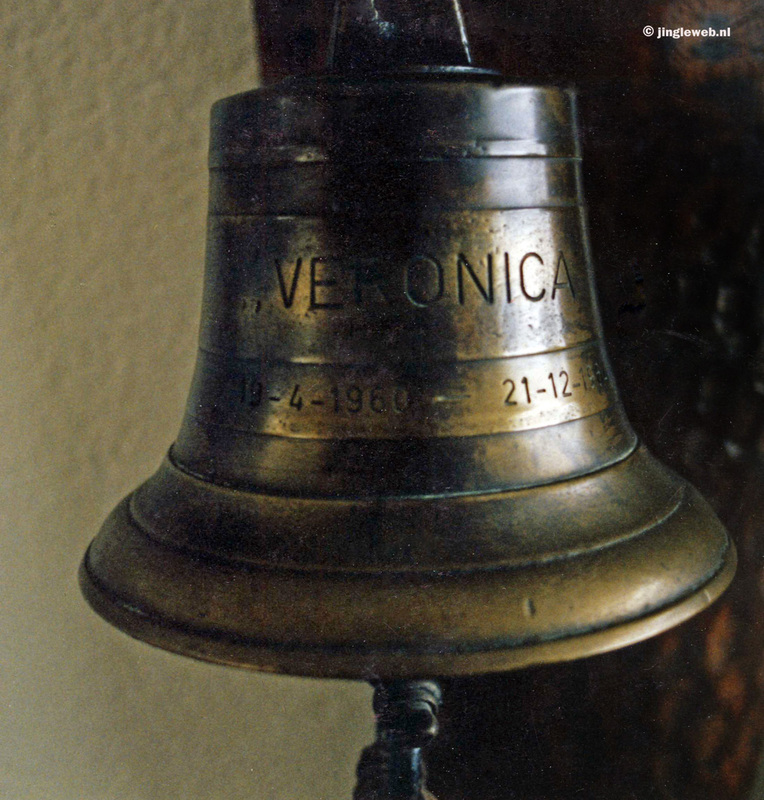 This is the original bell of the Borkum riff. 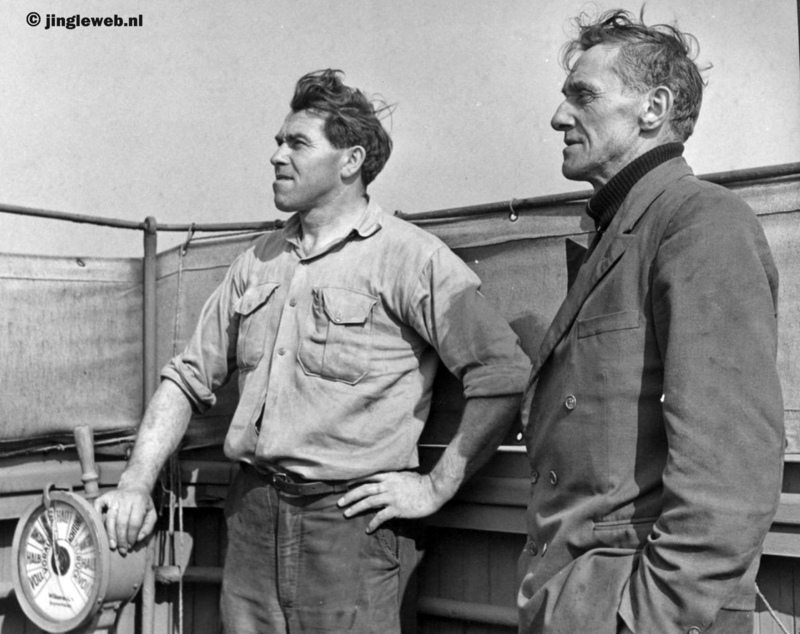 On the ship of Dirk Verwey in the Hilversum yaught harbour. 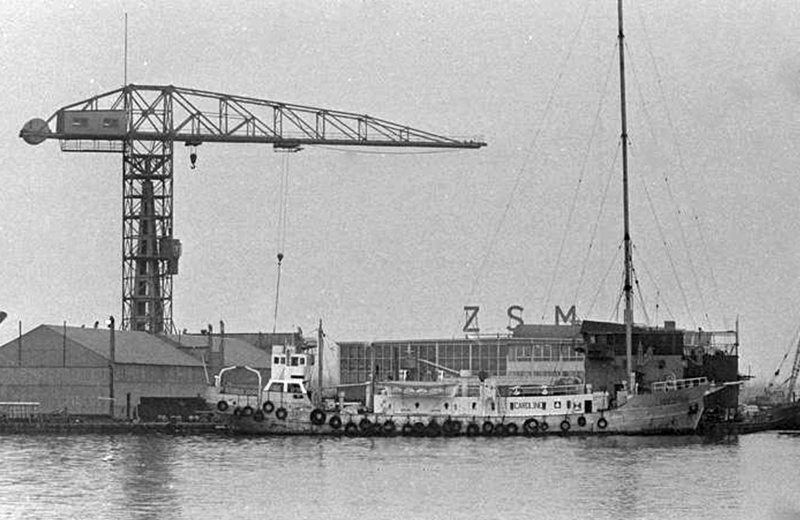 When Radio Caroline run aground in 1966 the ship went for repairs to Zaandam, at exact the same spot where the Norderney was fitted out. 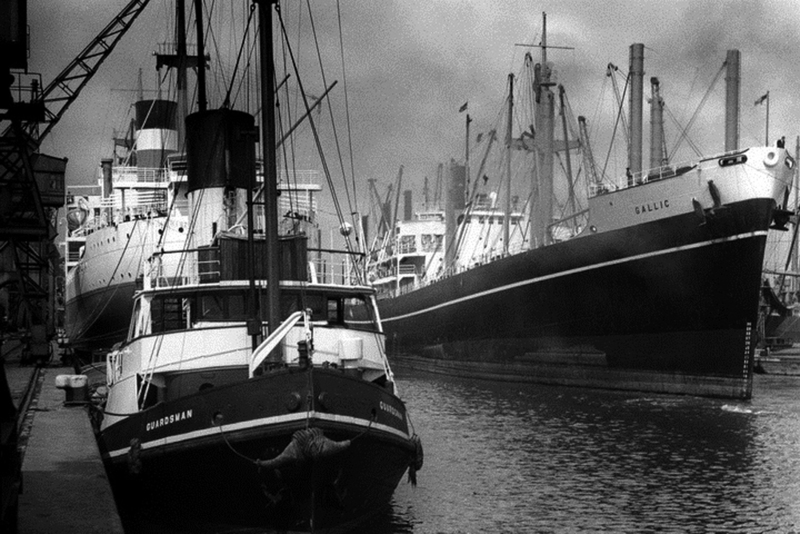 And this is the Radio England ship, yet at the same Zaandam quay in 1966. 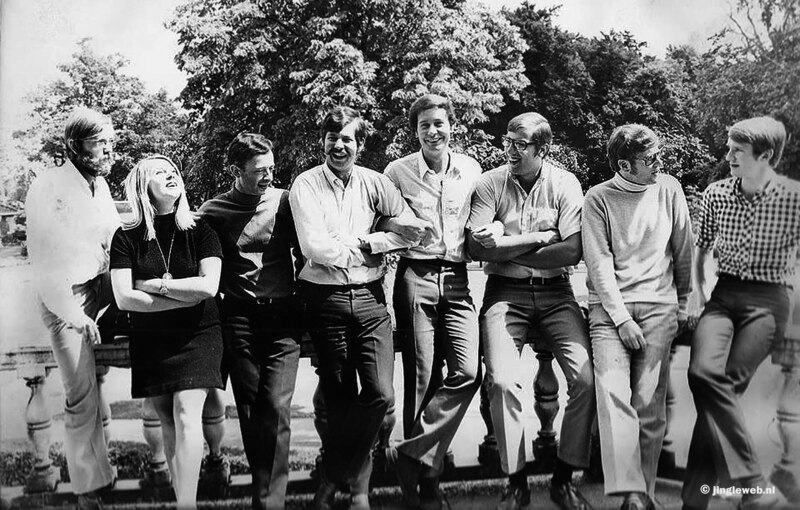 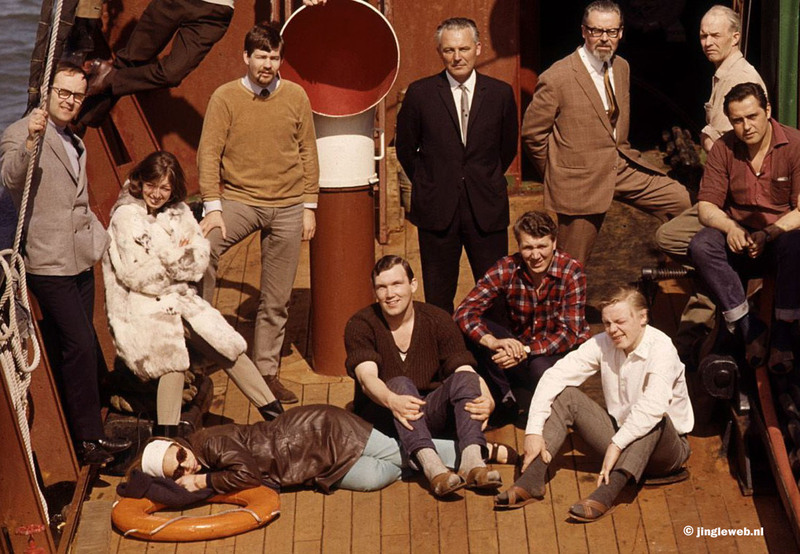 Establishing itself even further – here’s a staff photo of august 1967. 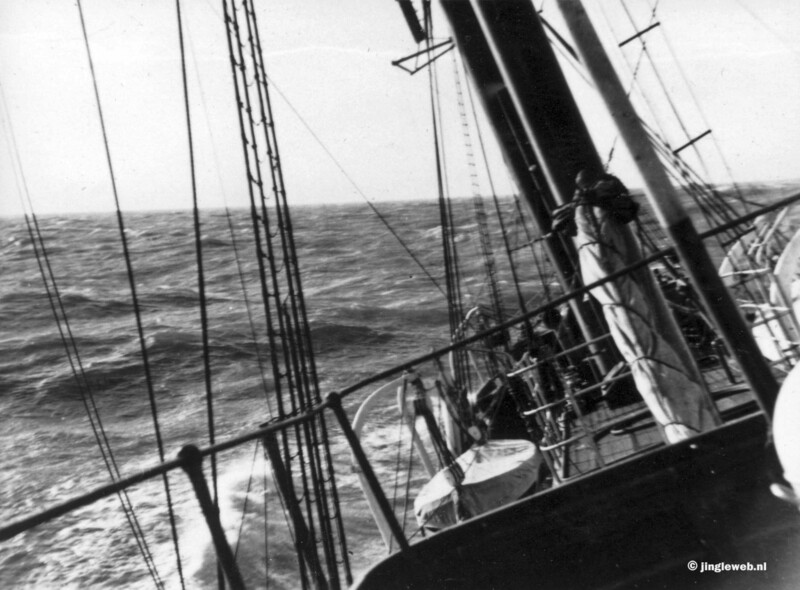 You can tell Tineke suffered from sea sickness. 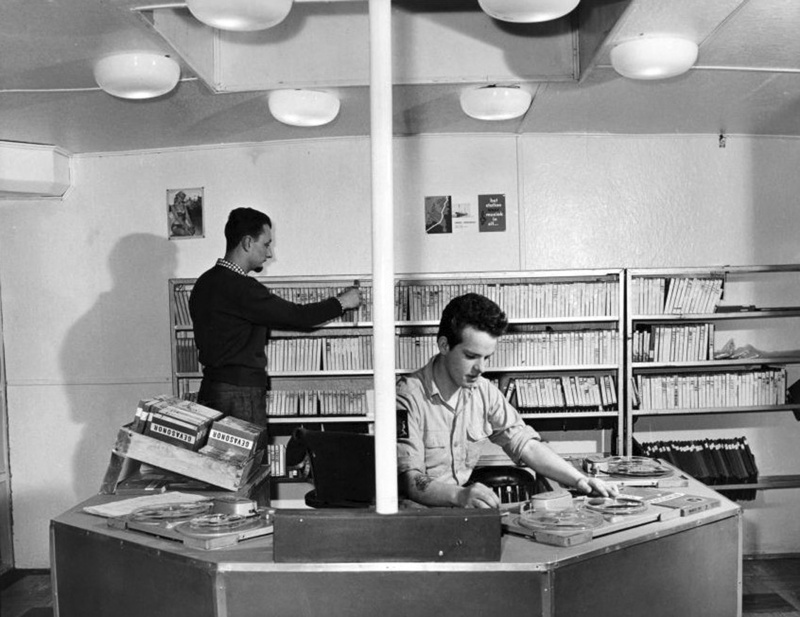 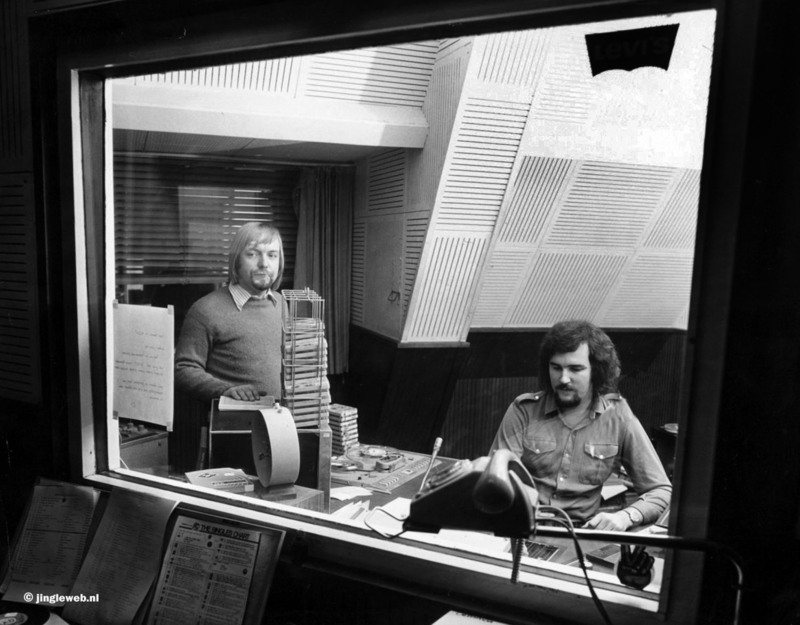 They bought a new studio building in 1969, with state of the art equipment (here with Dj’s Tineke and Gerard de Vries). 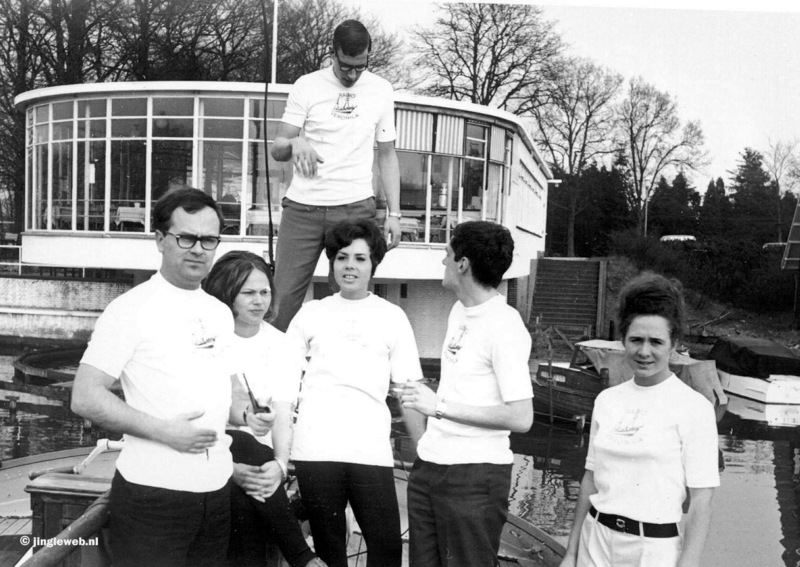 The DJ staff in the later half of the sixties. 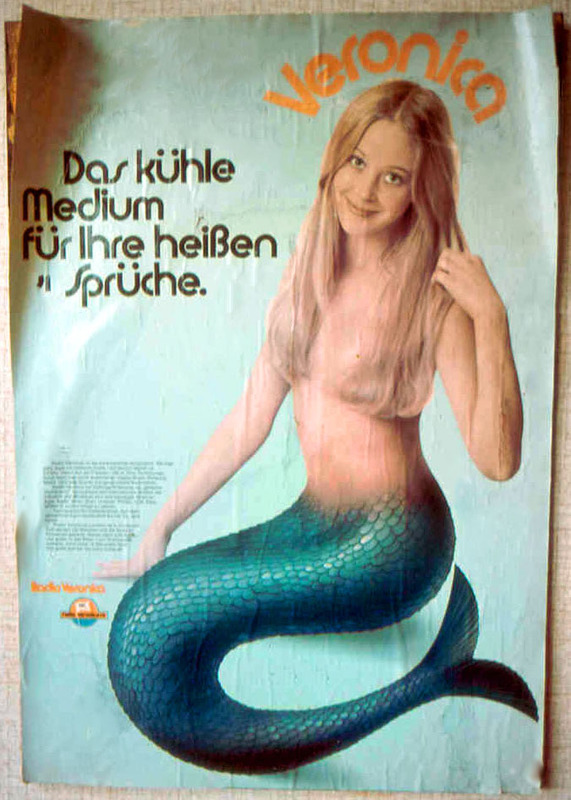 Veronica even tried to expand to Germany, according to this (rare) poster – but no German advertisers were attracted. 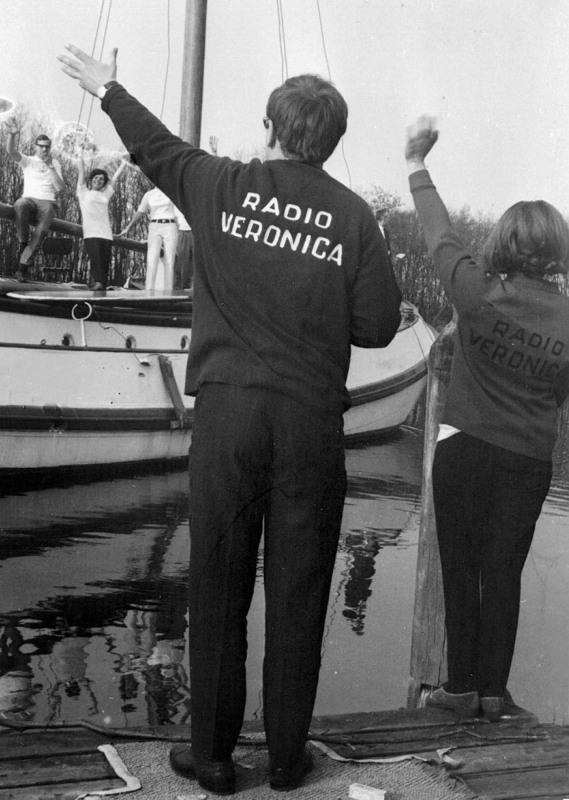 Meanwhile Veronica was still going stroing with new studios in Hilversum and a new jock, Klaas Vaak (at the left). 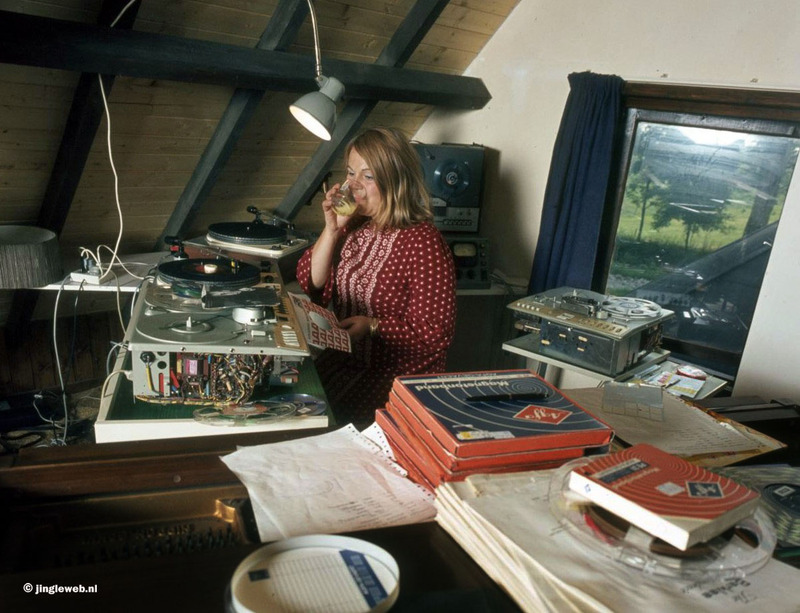 DJ Tineke recorded programs at home after an accident had made her less mobile. 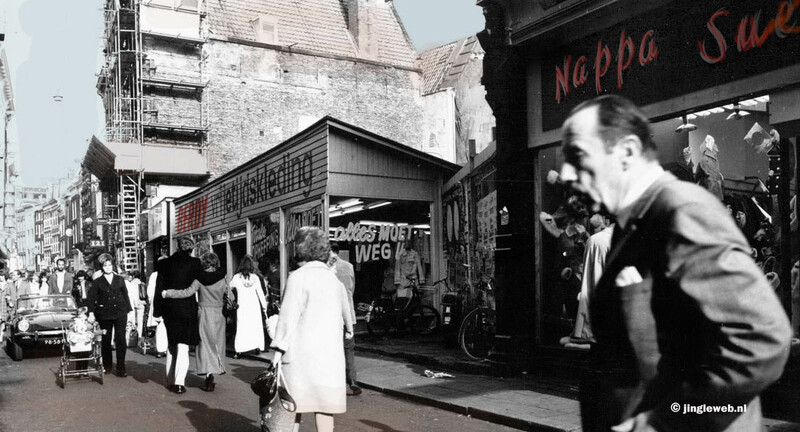 Berdie, Nieuwendijk 143 Amsterdam had become one of the main advertisers, a shabby outfit in reality. 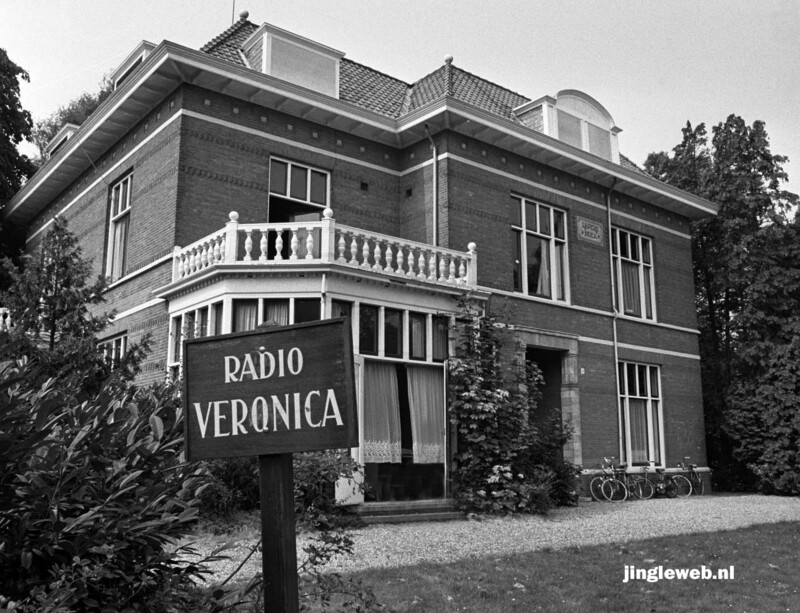 In 1969 Veronica got itself this posh office in Hilversum. 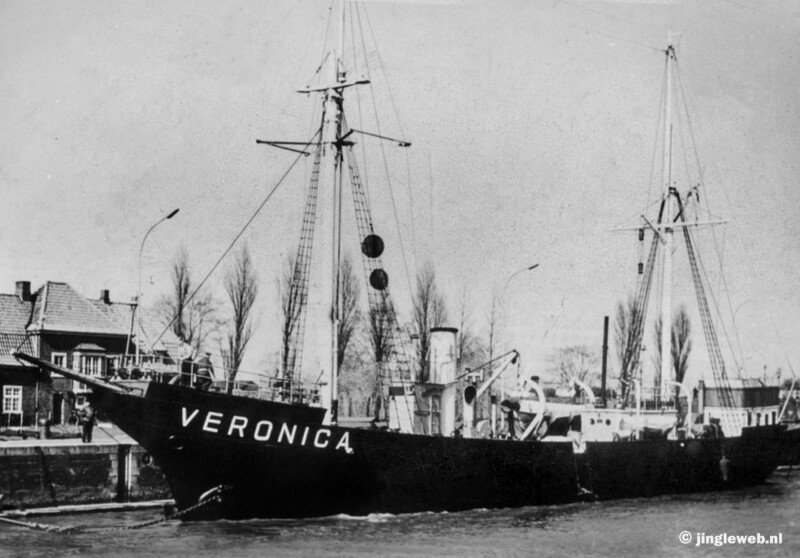 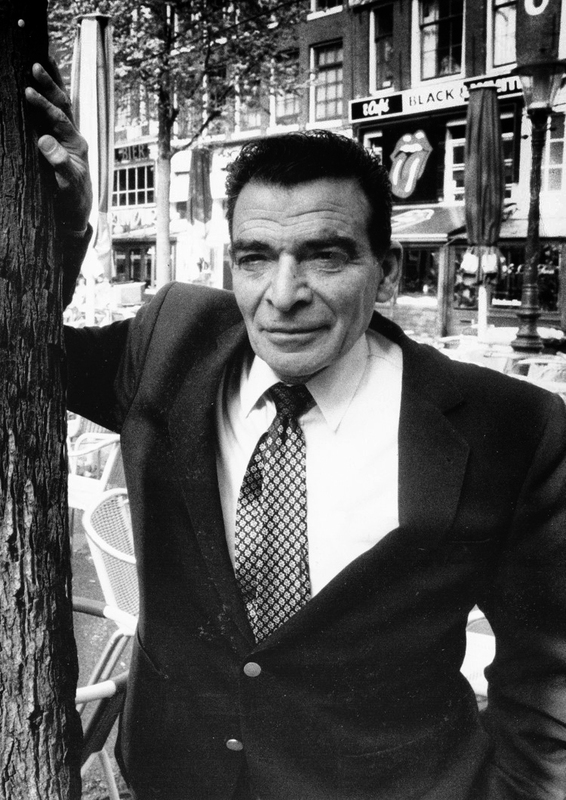 Veronica director Bull Verweij was arrested and was sent to prison for a year. 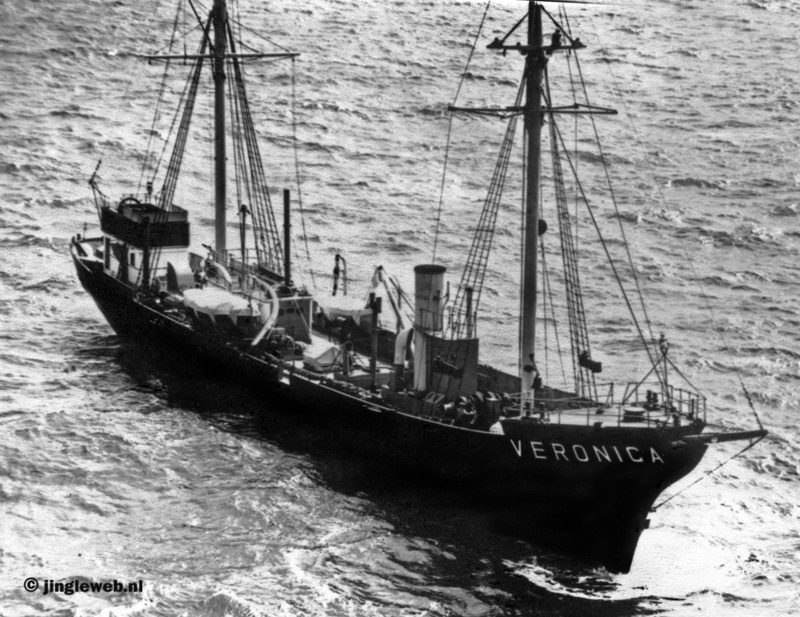 This is how it could have been too: when money ran out Veronica invested in Northsea to keep them from their door and took the ship in security. 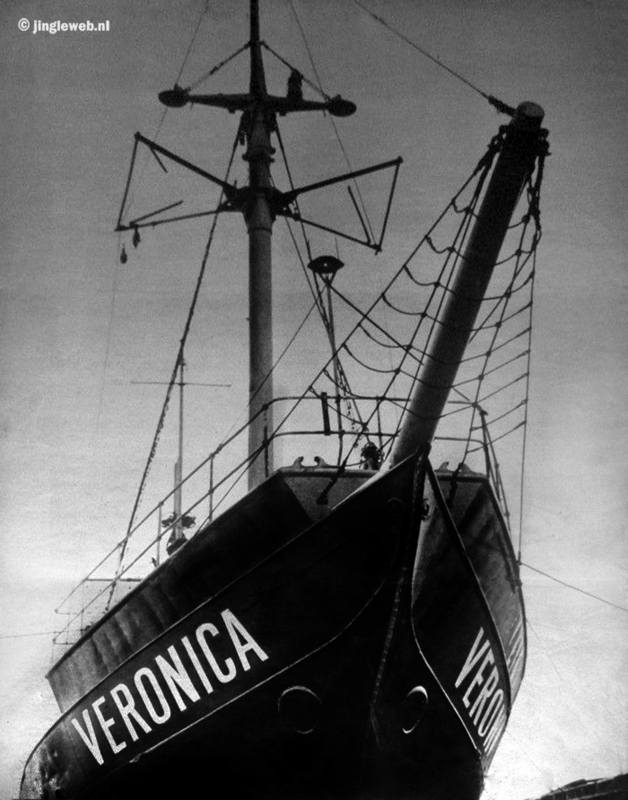 They asked a judge to collect it – he said no, otherwise this is how the ship could have looked in Veronica ownership. 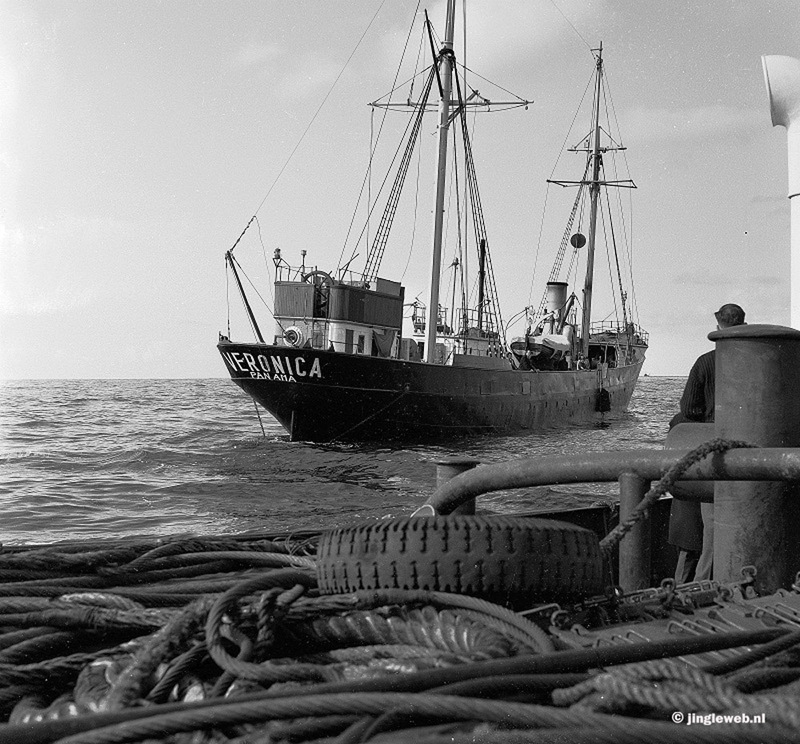 But in june 1973 it was decided that the offshore stations had to go, in about a year’s time. 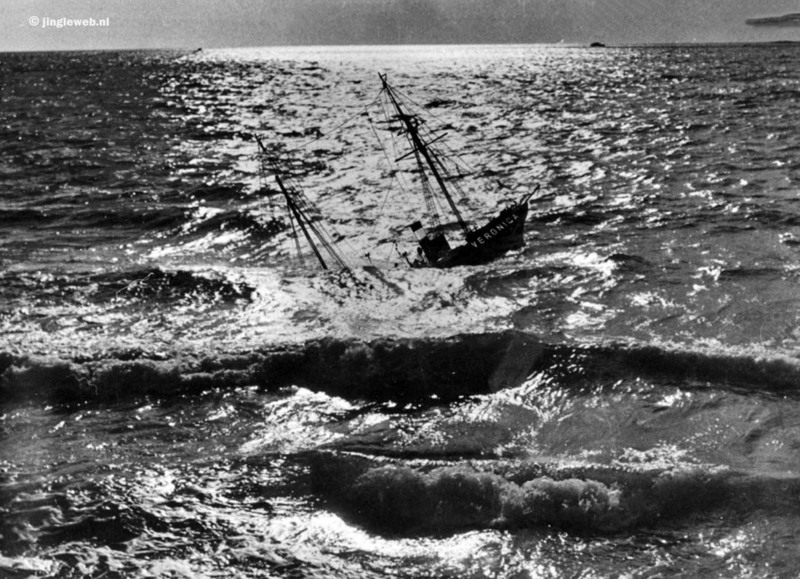 Time was starting to tick away. 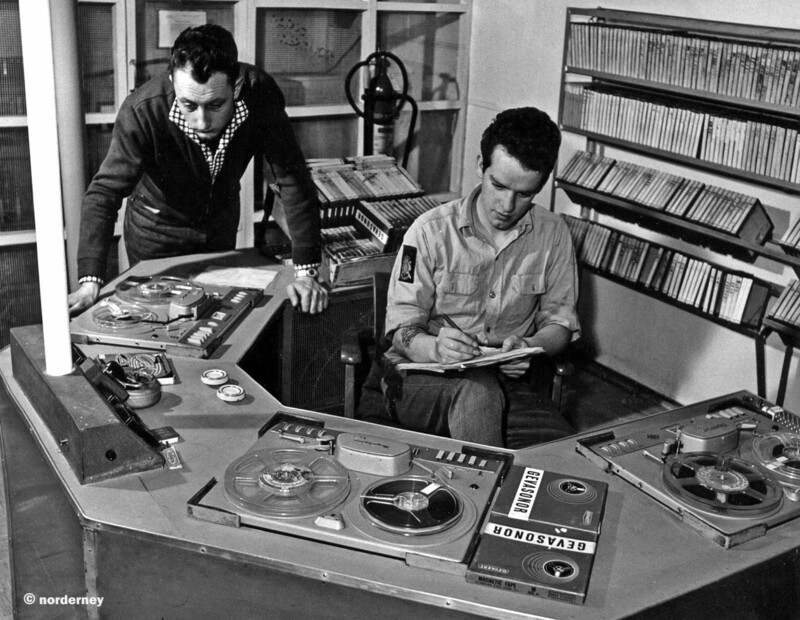 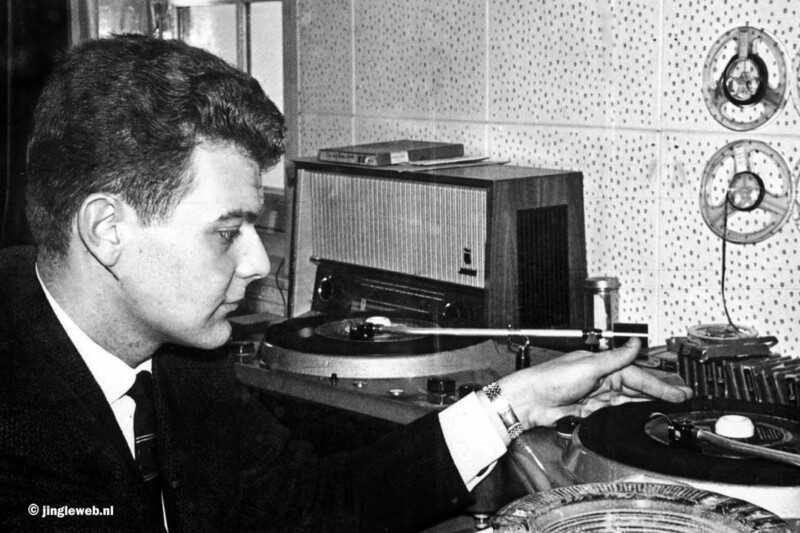 With the DJ taping programmes in Hilversum (here is newcomer Frans van der Beek). 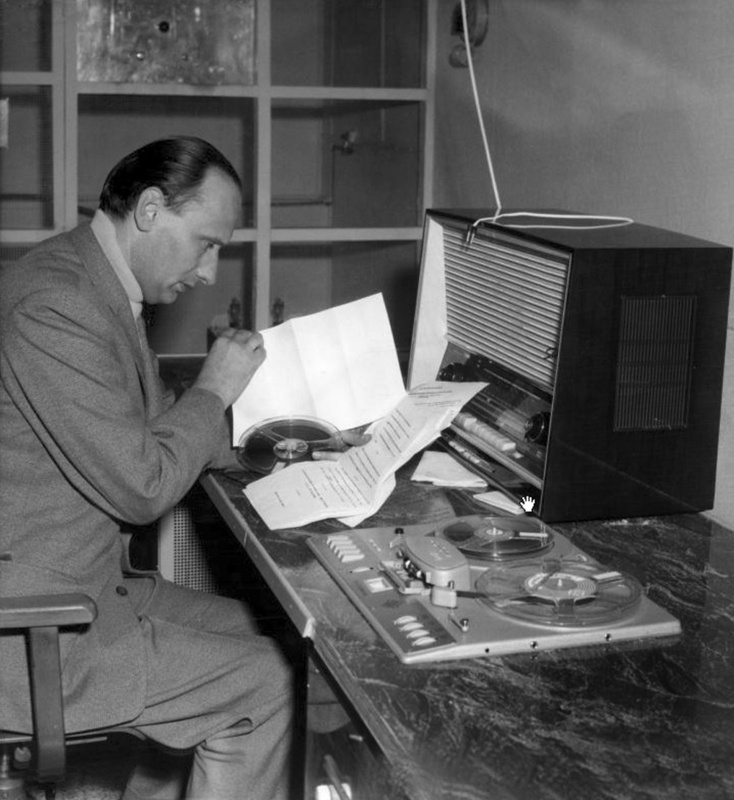 And Cees Man in ’t Veld reading the hourly news bulletins aboard. 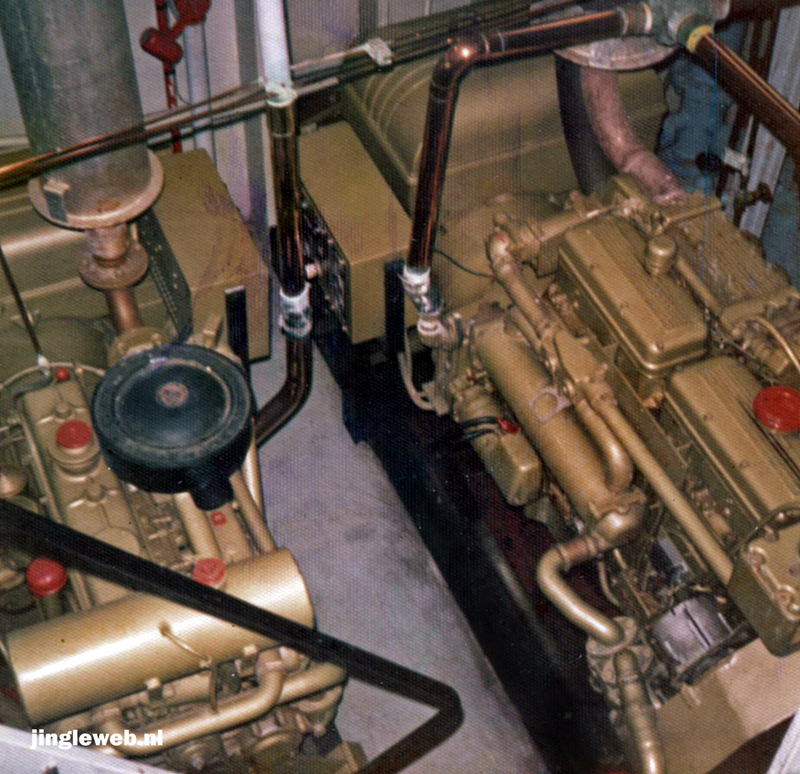 And the generators snoring away.